A few months back we decided to start crushing our own grain so that we could buy bulk grain sacks and have better control of our mashing process. 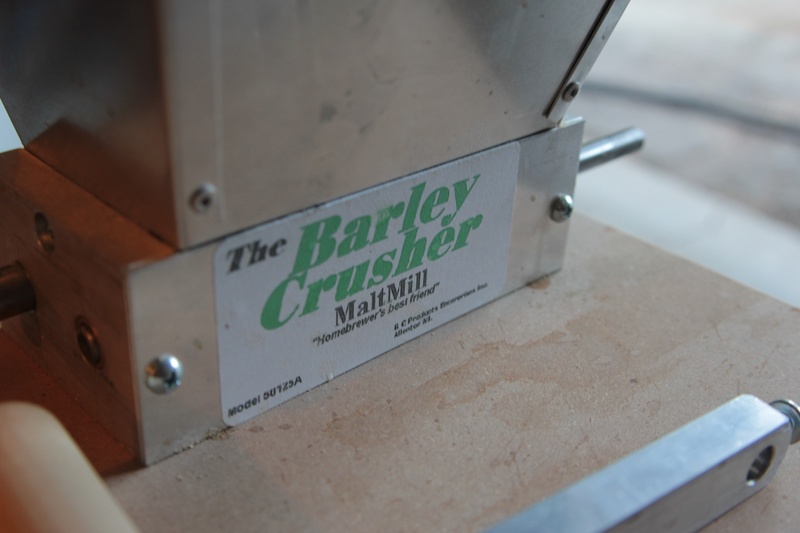 After shopping around and reading all sorts of reviews we went for the Barley Crusher through Northern Brewer. A few days later a huge but light box arrived on our doorstep. 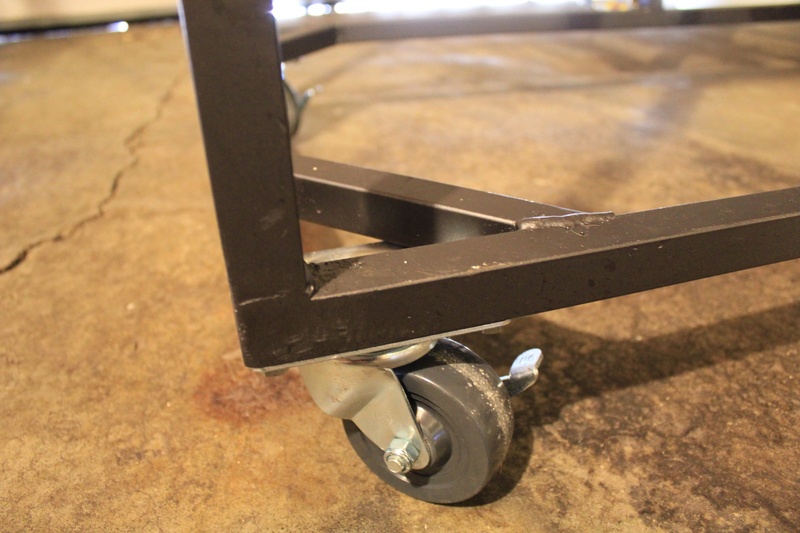 We quickly ripped into it and pieced the bottom base and the hopper together securing it with two screws. 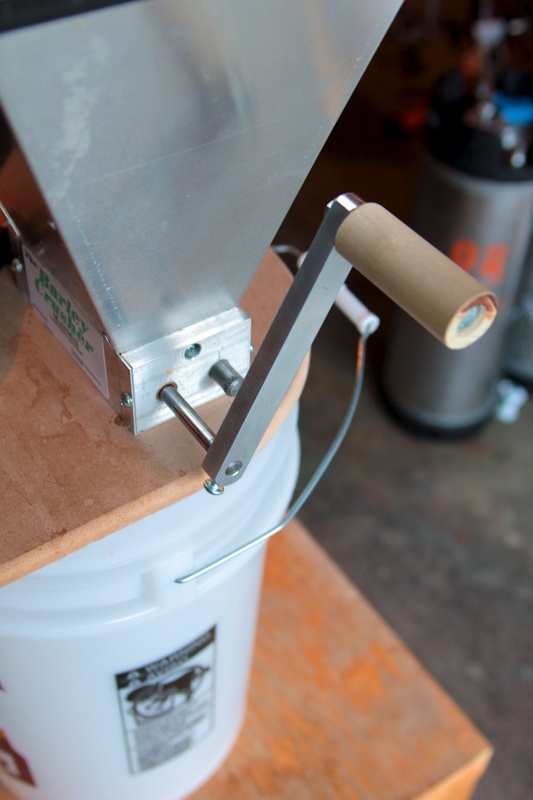 The base of the hopper has three rubber feet that help to secure it snuggly onto a 5 gallon bucket. 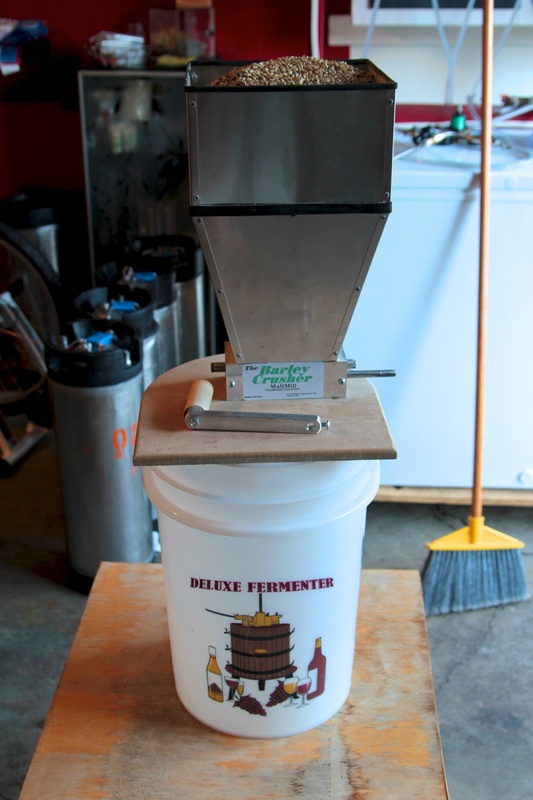 We opted for the extended hopper since we generally do 10 gallon batches on our system and wanted the extra space. Even with the extended hopper we usually have to fill the hopper twice to get through all the grain we are crushing. 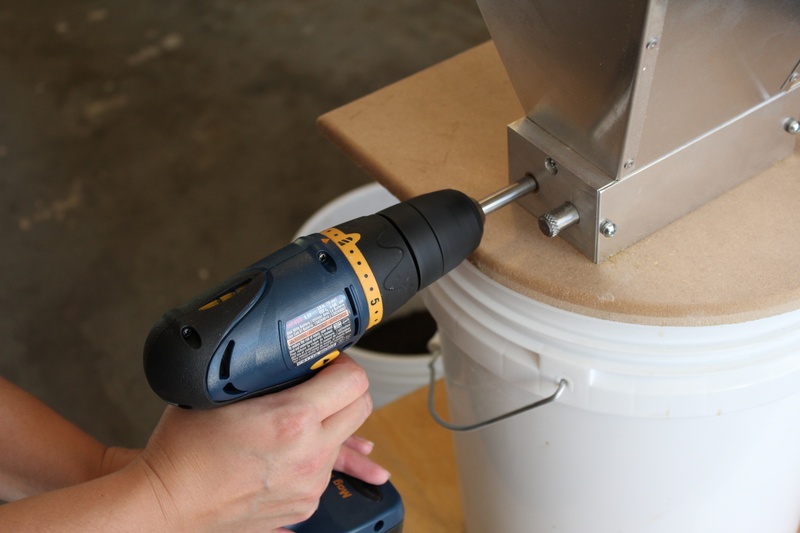 The Barley Crusher comes with a manual handle so you can crush your grains by hand if you choose to. We tried it out the first time, spent a few minutes spinning it around, looked at how much we had accomplished (next to nothing) and decided that we would only pull it back out again for friends to use when they want to come over and join us for a brew session (make them work for that homebrew). We then hooked up our drill instead and blew through the grain much quicker. 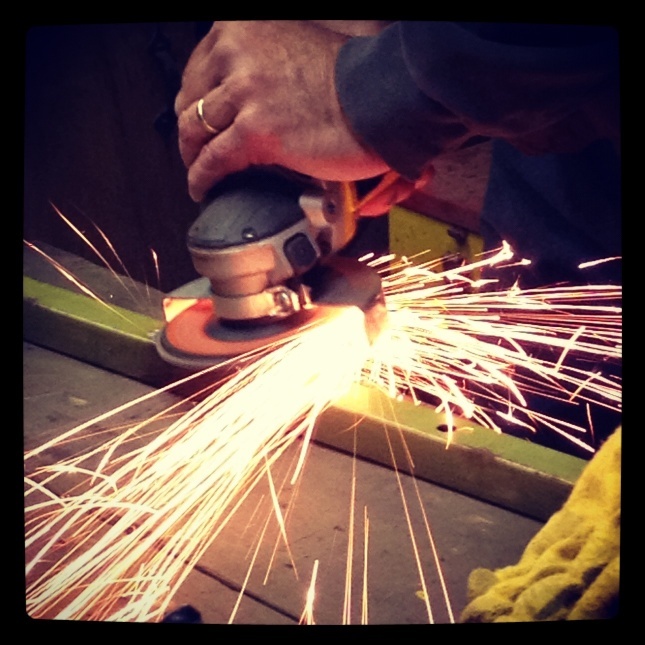 The drill has become our go to way of using the mill. 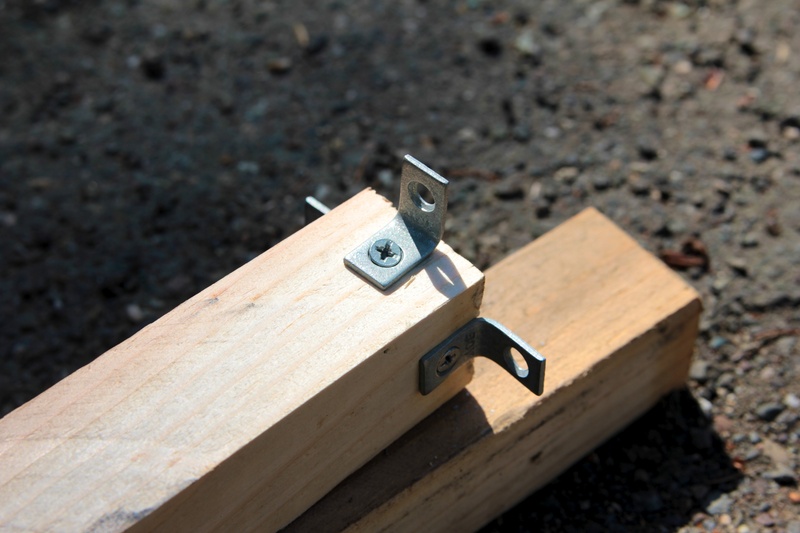 It attaches to an extended shaft and is as easy to attach as a normal drill bit. We are using a little Ryobi cordless drill and we can usually get through the full 20+lbs of grain before the battery goes dead. 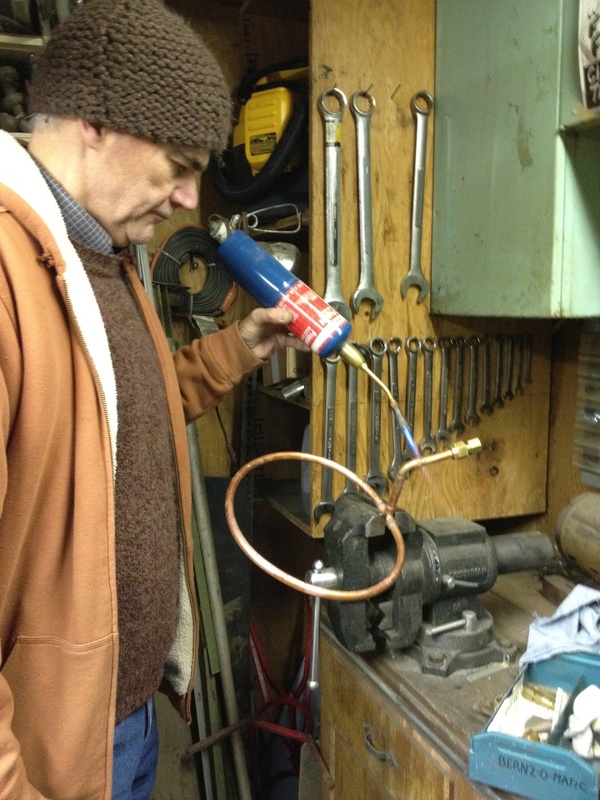 A corded drill would probably work better for this purpose but we haven’t decided to pick up a new drill yet. 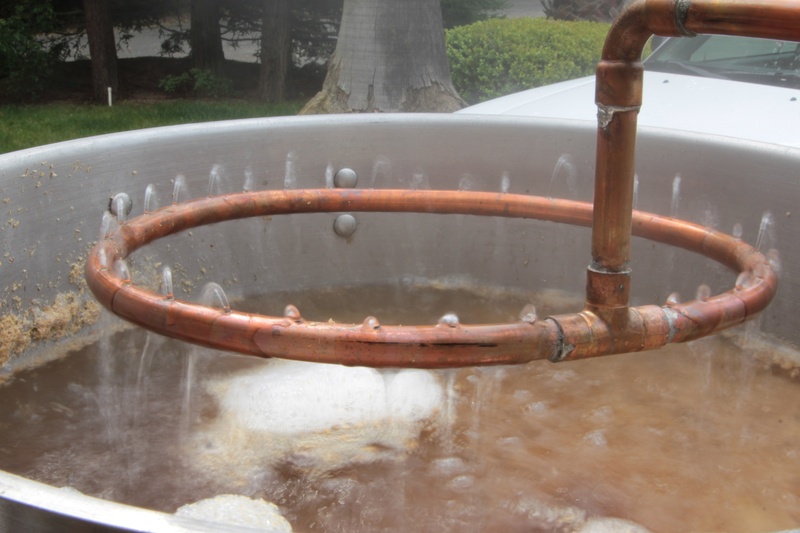 We almost always crush directly into 5 and 7 gallon buckets which we then add to our mashtun. We usually have to use two buckets for an average 10 gallon batch with a third bucket for those really large grain bills. One thing I read about but wasn’t completely sure would happen is that crushing your own is supposed to increase efficiency. 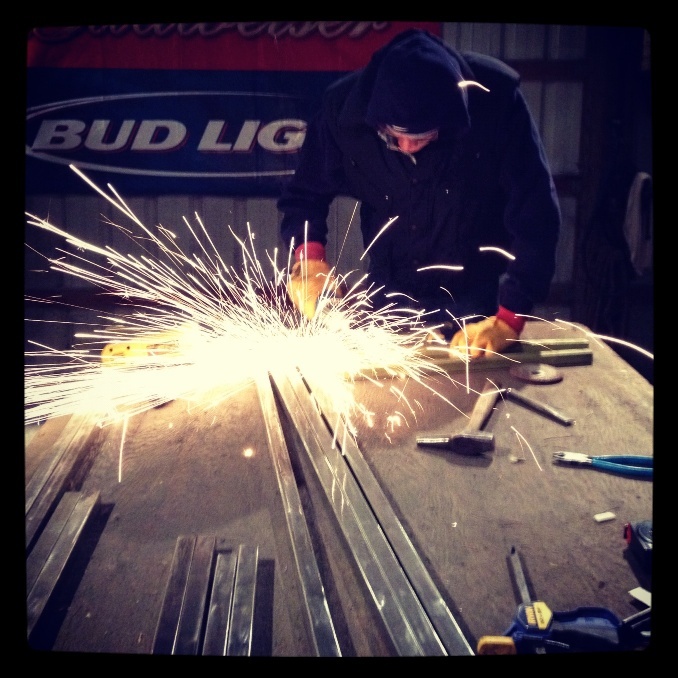 It has, the Barley Crusher has helped increase our efficiency by about 10%. 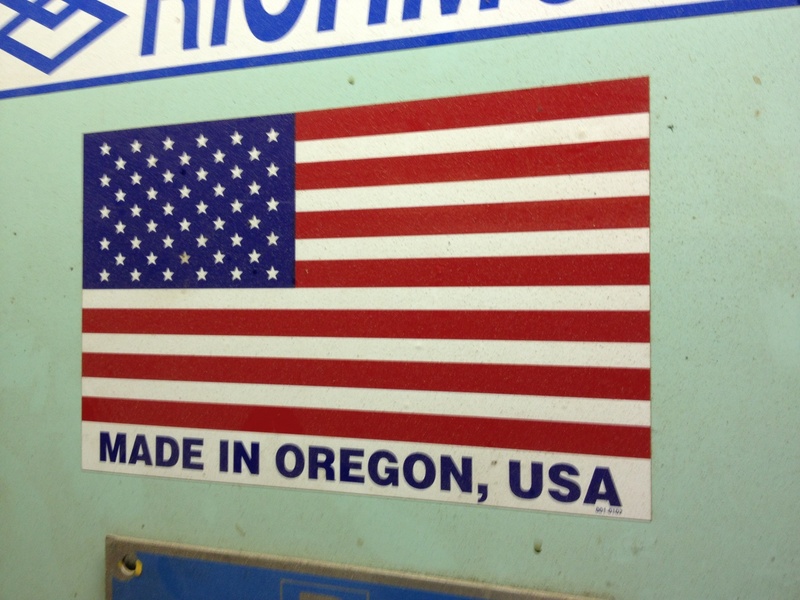 Before we started crushing our own grain we would get crushed grain from our LHBS and a few online retailers. 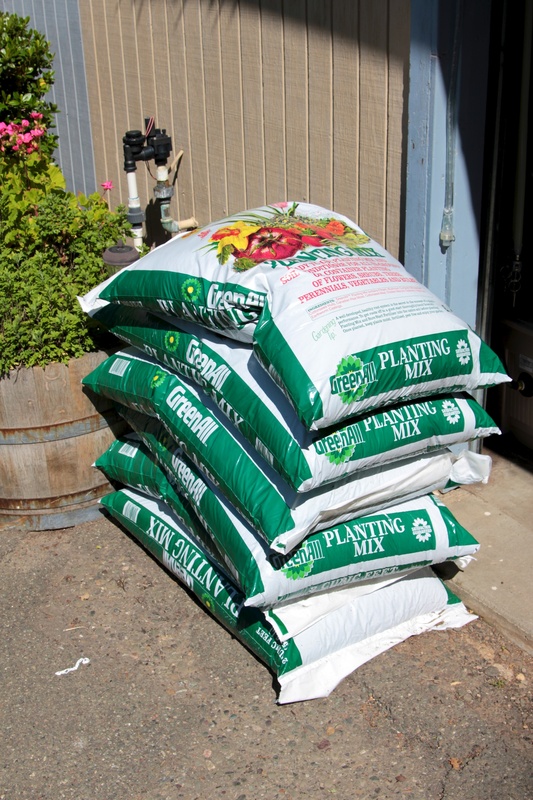 We usually got around a 65% – 70% efficiency with these crushed grains. 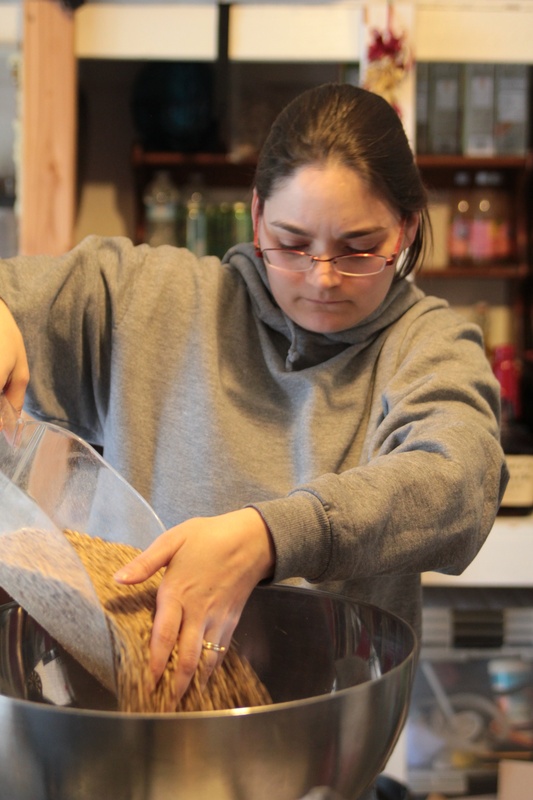 Now crushing our own grains we generally get 75% – 80% efficiency. It has actually made us scale back our recipes slightly to still maintain the same profile we used to brew them at. 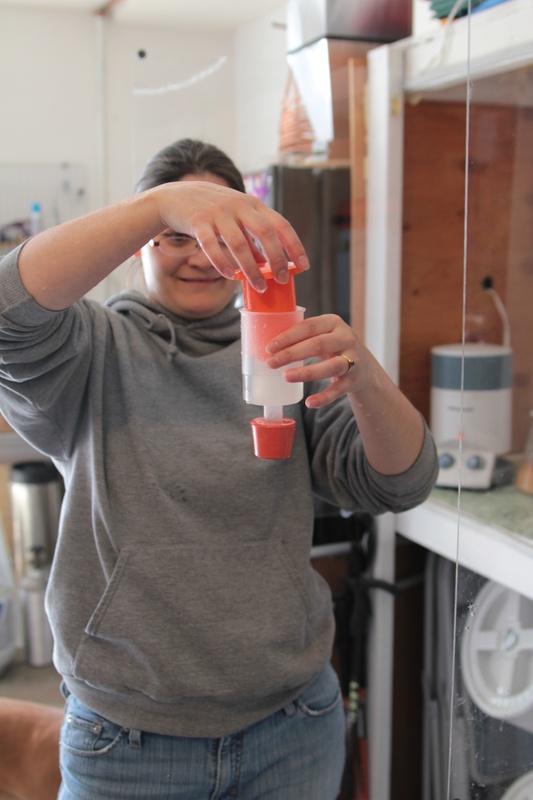 It’s also helped us to be more flexible in our brew sessions. Now we keep a number of bulk base grains on hand in Vittle Vaults and a good supply of adjuncts. It’s great being able to look at our inventory and our recipes and decide that this is the beer we want to make and have the supplies on hand to just do it. 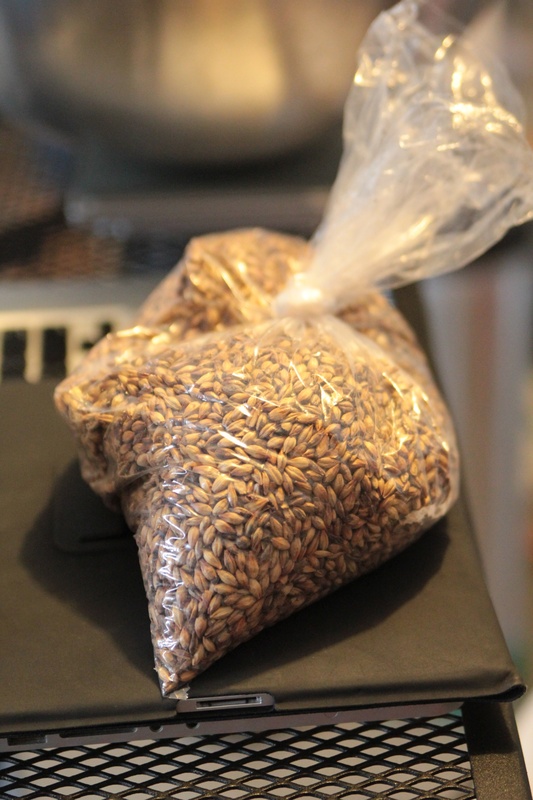 Even better if a brew has to be cancelled for some reason the grain has not been cracked and is still instead waiting in its air tight container. 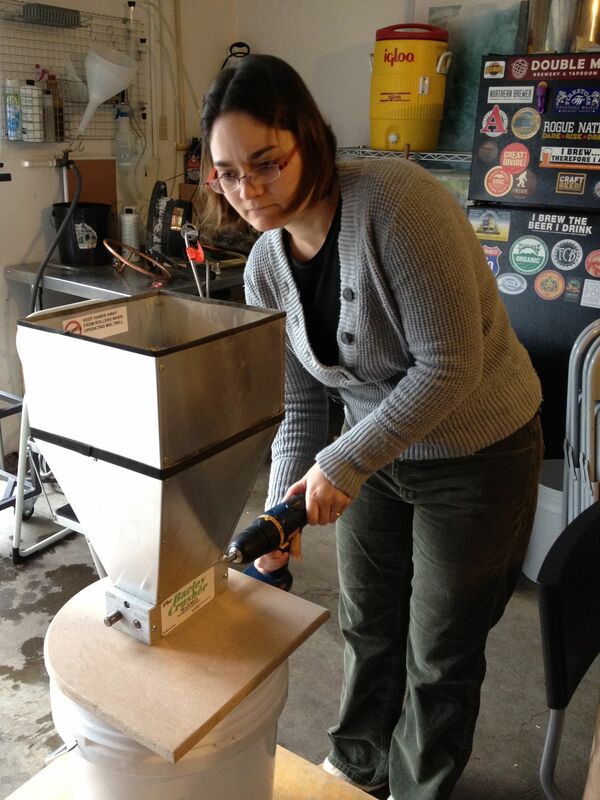 Overall we are really happy with the Barley Crusher and the added flexibility, efficiency and fun it has added to our brew days. 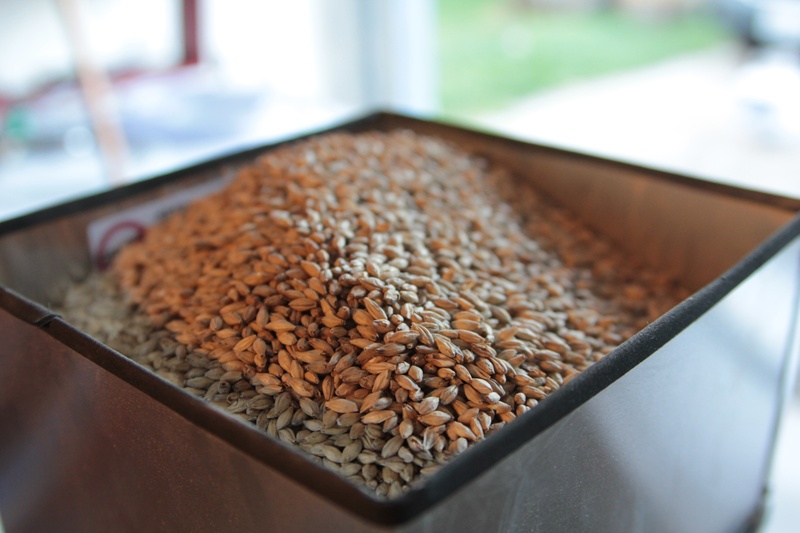 If you are doing all grain batches and haven’t decided to crack your own yet you should really consider it. When I originally watched this video a few months ago I had not heard of Freetail Brewing or of Scott Metzger. I was immediately drawn in when he presented the idea that the way our market works is failing communities by creating an economic incentive to buy big brand items instead of local options. He ties this argument back to the beer industry and how it had collapsed into a very small consolidated brand and style market. But consumers like variety, choice is important. Scott continues to state that in the 1980’s the craft beer industry got started and instead of following the same consolidated model that caused the collapse of the beer industry post prohibition, the focus was instead on creating “economies of authenticity”. The reasoning goes that if you offer variety and quality products people will go against what the market says should happen and instead go for those authentic products. So by encouraging entrepreneurs to pursue their passions and to stay true to their authenticity we will purchase those local authentic products and help to create community. 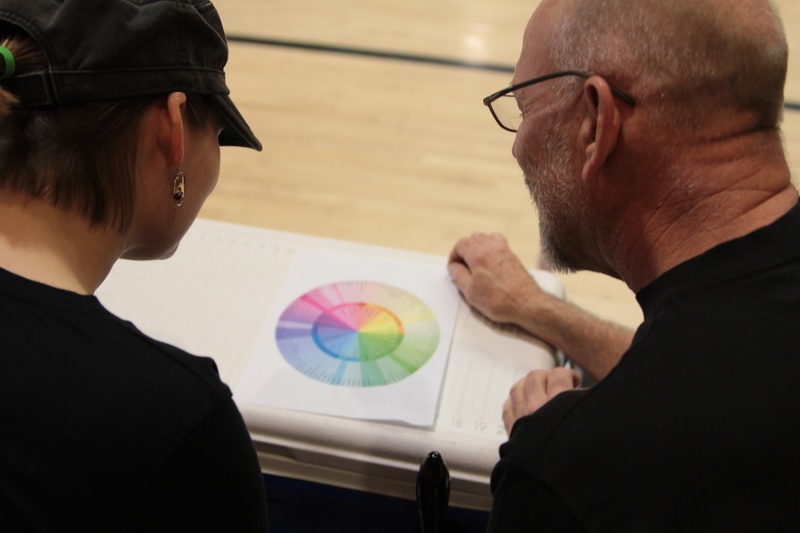 For me Scott hits all the key elements, first by being authentic and true to your passion you will remain excited and working hard for your business. Second, by focusing on the quality of your product and instead of just the bottom line we create better products and businesses. Finally by following the first two elements you will create the foundation of your business that other businesses will look to emulate and by doing so everyone will help to create a better community. It’s this final piece that resonates the most with me personally because I believe a good business, especially a brewery, should always be thinking about how they are a part of and how they help lift up their community. Thanks Scott for a great TEDx talk and I hope sometime to be able to come down to San Antonio to check out how you are crafting a better beer, business and community. 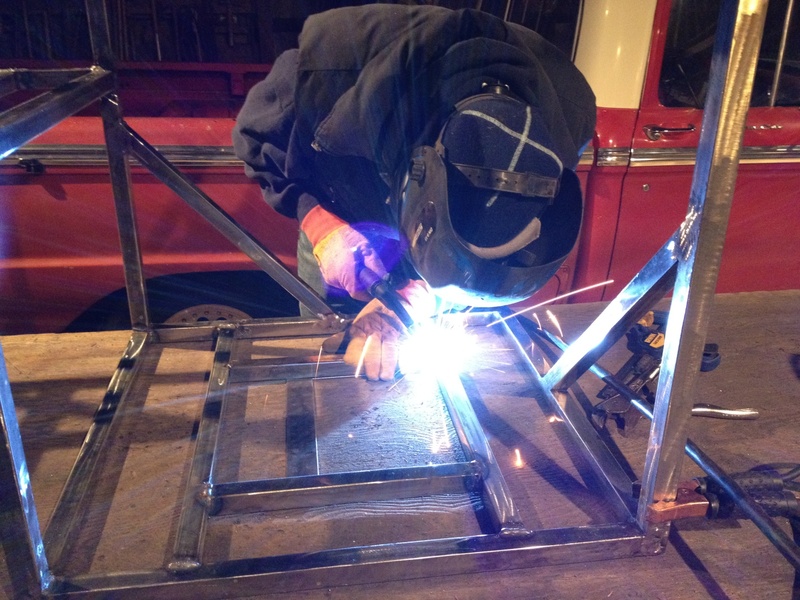 If you’ve read our post about our new brew system then you’ll know that it was constructed from an old Hi-Lo trailer. 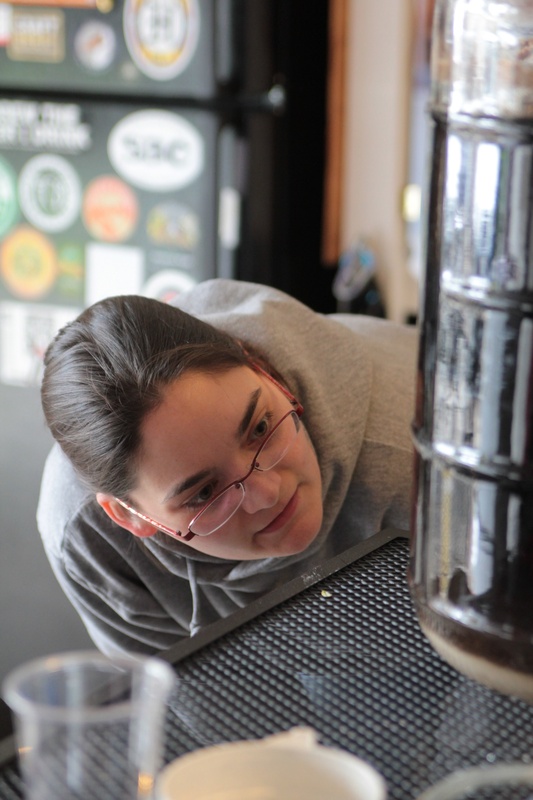 As an homage to that trailer Eryn decided that the first beer we made on the brew system would be called Hi-Lo. With the name firmly set we went to work figuring out what it would actually be. Since we had two great words in the name, high and low, we started playing with the idea of doing a high alcohol low hop Belgian ale. It finally came down to a Belgian Strong Golden Ale that was lightly hopped. So the next question was what kind of hops? We didn’t want to use traditional hops because we weren’t really looking for a traditional beer so we spun the globe around and landed half a world away in New Zealand. We have been reading about New Zealand hops for some time and even ordered some up so this was going to be our opportunity to try them out. The hop of choice ended up being Nelson Sauvin with just a bit of Tettnang. 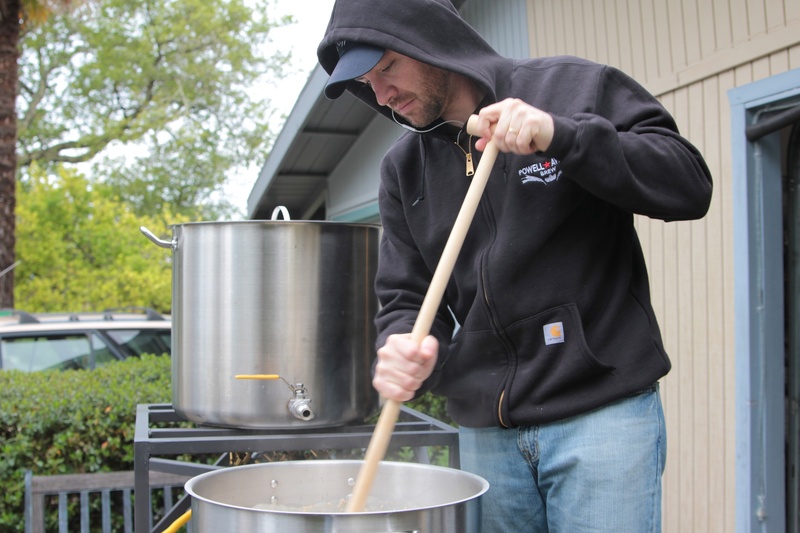 The brew session went great. 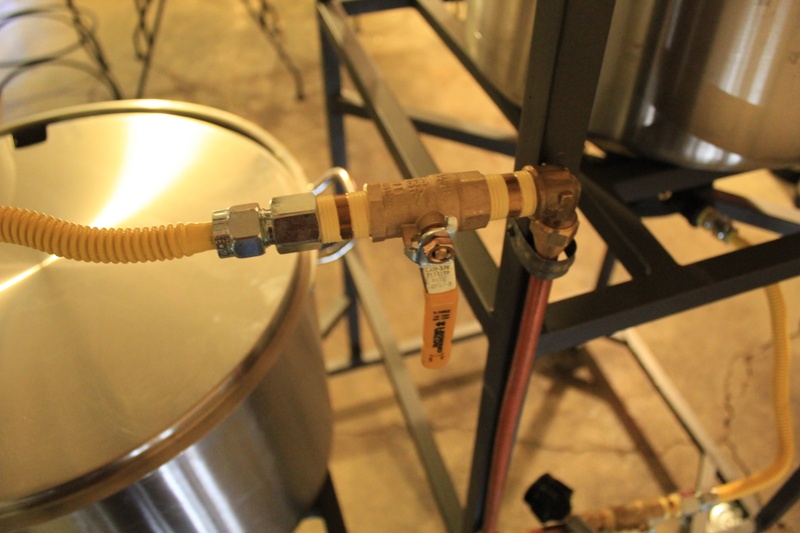 It was the first time we brewed on the system and our excitement was high. Everything was just there, ready to use. To our delight we over achieved our OG and got it fermenting. The fermentation quickly kicked into high gear. After an extended fermentation we kegged up the beer and let it rest for a few months so the hops and alcohol could come to a mutual agreement of enjoyment. As the beer came in at nearly 10%, putting it on draft was something we decided to avoid so into bottles it went. After letting it rest in the bottles for a couple weeks we finally broke it out at a tap party that Eryn’s dad, and the brew systems fabricator, was able to come down for. And how was it? Knockout. 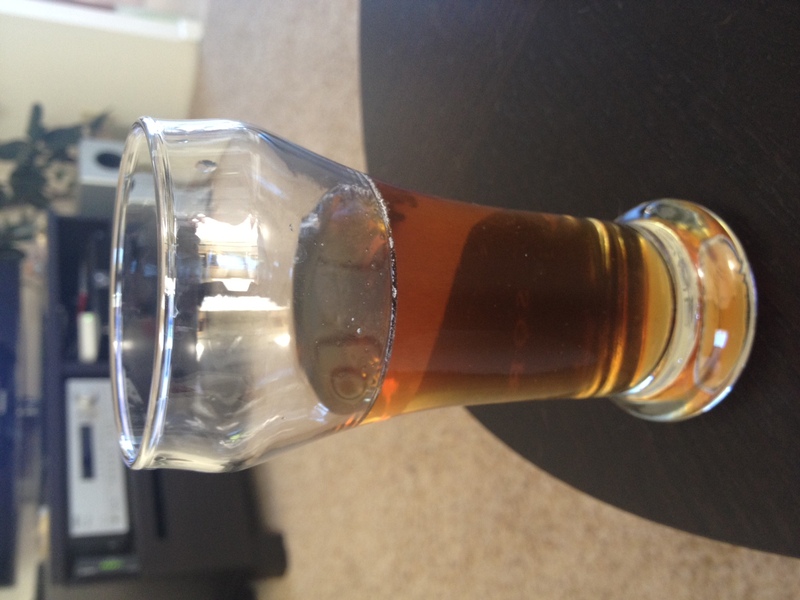 The beer pours with a great golden color and a nice light head that goes away quickly. The aroma is fruity from the hops with elements of gooseberries and pez candy. The flavor takes those same aromas and translates them to taste. There is just a hint of bitter with a nice smooth finish. You cannot tell it is anywhere near 10% until you finish the first glass. The beer went over so well at the party and at subsequent pourings that we will be making it again, but we will always be pouring it out of small bottles into small glasses. The recipe will be posted after a few more tweaks. 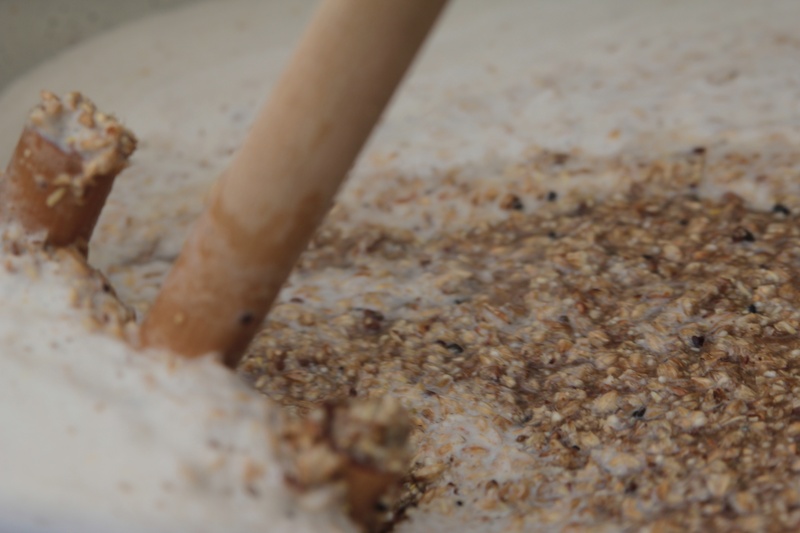 Fermentation is a point in our brewing process where we’ve always had a bottleneck. We’ve been using 5 and 6 gallon glass fermenters since we jumped to 5 gallon batches but have always been looking for something more. 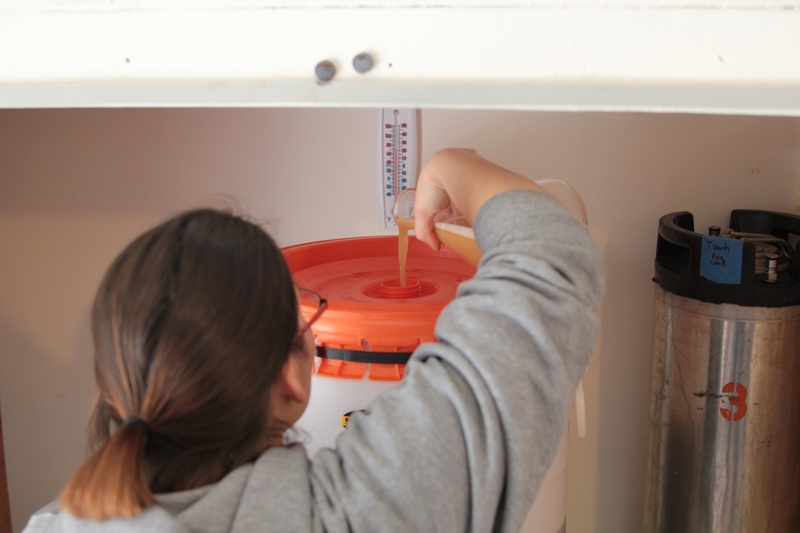 This past fall MoreBeer had a very quick sale on Speidel Plastic Fermenters. I happened to catch the sale thanks to Homebrew Finds and because of the price jumped on making the purchase. After I made the purchase several concerns ran through my head; it’s plastic, there were no reviews, how well does it seal? I figured it was worth the cost to experiment with it but I really hoped it wouldn’t be a dud. Now several fermentations later I can happily report back that the Speidel is great. My concerns have amounted to nothing and the benefits are huge. 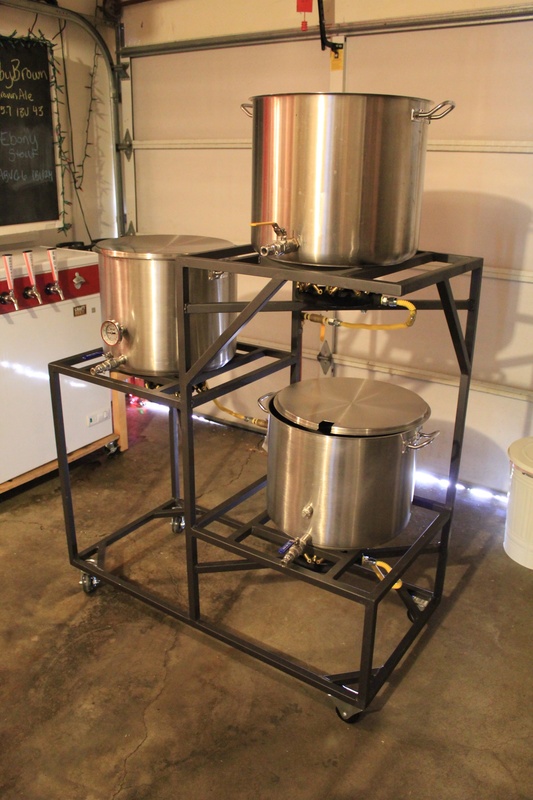 I purchased the 60L version because it would be able to hold our 10+ gallon batches no problem. 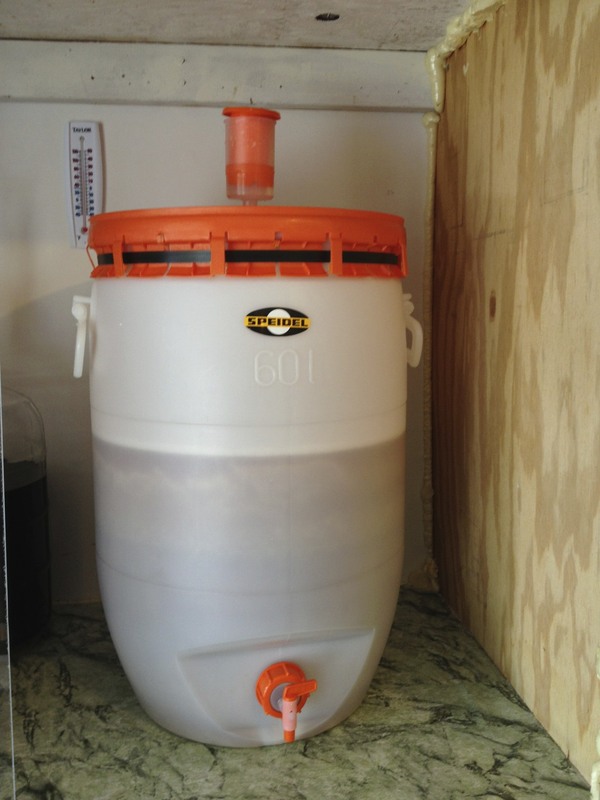 Now instead of separating our batches into two carboys we can ferment the whole batch in the Speidel. 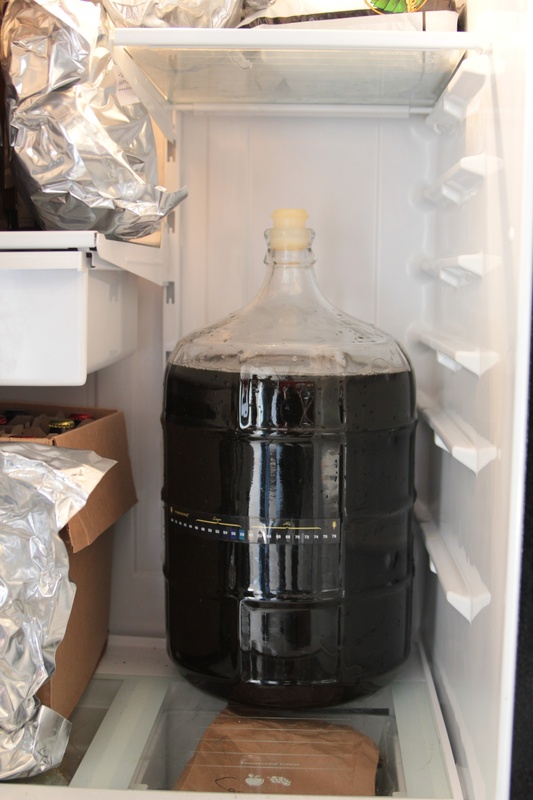 It’s also very light compared to glass carboys. It’s easy to move around when empty. 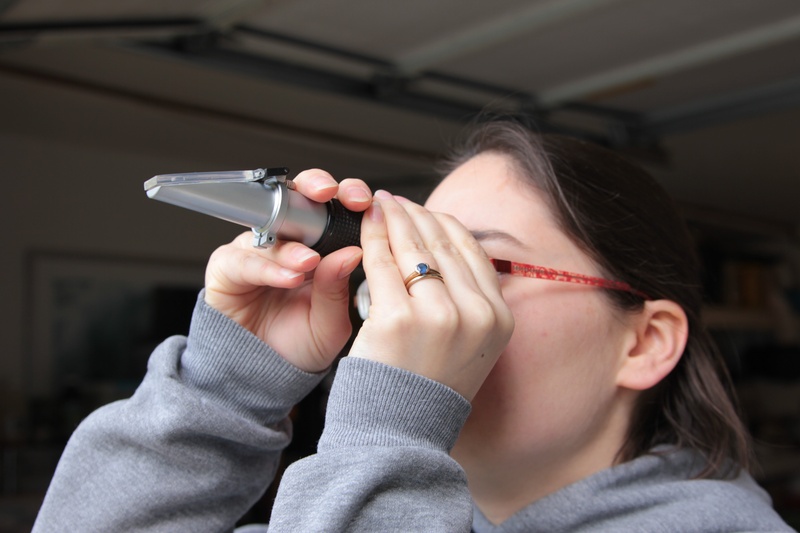 The pour spout on the bottom has also been great, we can take samples whenever we want easily to check gravity. 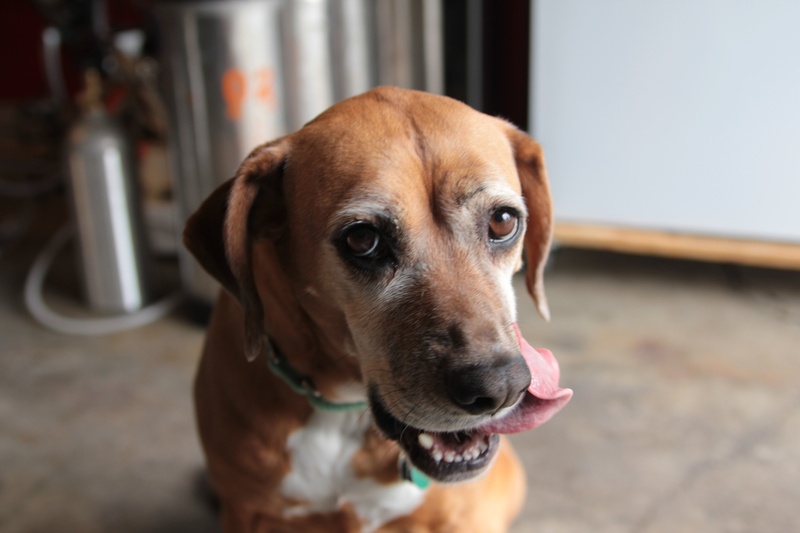 This has allowed us to keep better track of how our fermentation is going. Finally, the whole top of the fermenter comes off allowing you to easily add dry hops or other crazy additions like strawberries or coconut (we put all additions in hop sacks so we can pull them back out). Being able to pull the whole top off also makes cleaning much easier. We can spray and wipe it down without having to use stiff brushes, reducing the chances of scratches. 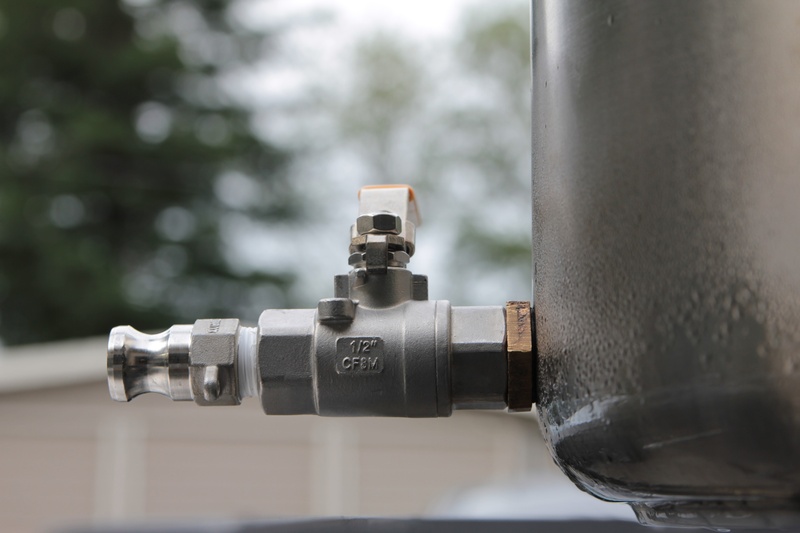 My only complaint about the Speidel is that the spigot usually lines up with the top of my trub so the first bit of beer we pull off has a little yeast in it. That being said I’m already signed up with MoreBeer to be notified when the next batch of Speidels come in so I can pick up at least one more. Overall I’m really happy with the Speidel and look forward to continued use until it’s replaced by a stainless conical. I originally wrote this post over a year ago and I just wanted to note that the Spiedels are doing awesome. 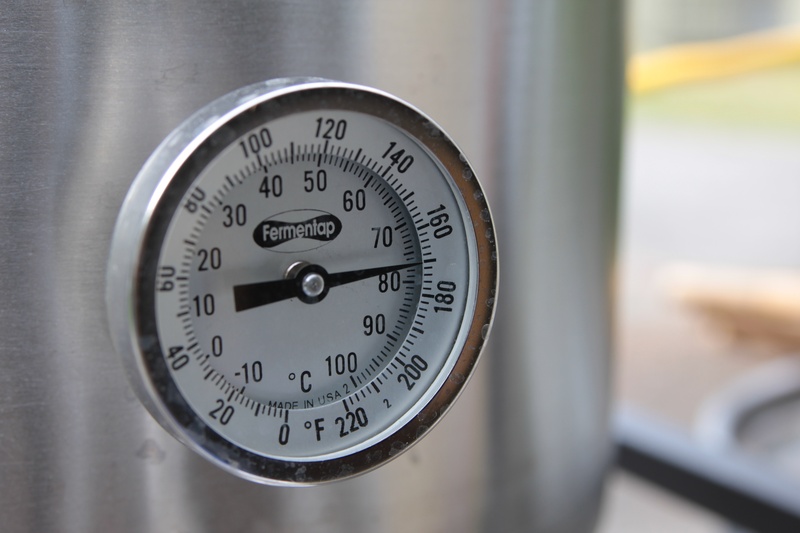 We picked up a second 60L to use for our primary beers and a 30L for some of our experimental batches. 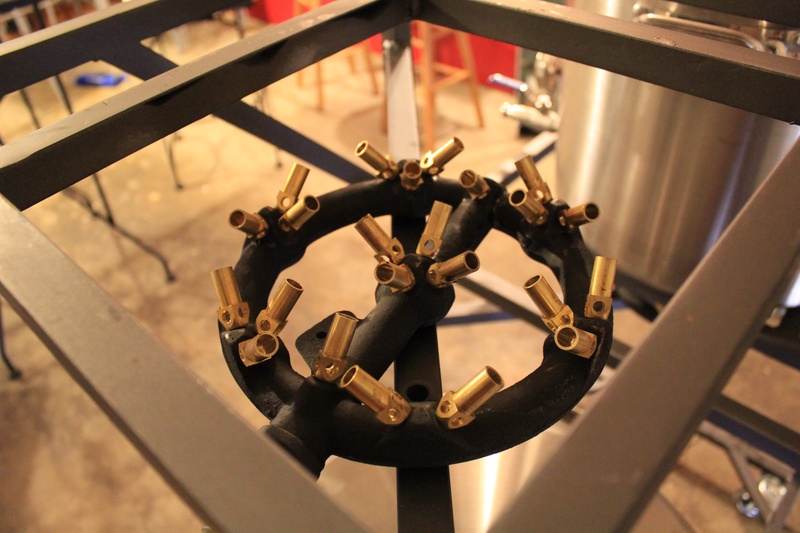 The only problem that we’ve had so far is the large O-ring on the lid of the first fermenter split. We super glued it back together and so far it has been fine. I still highly recommend the Spiedels. 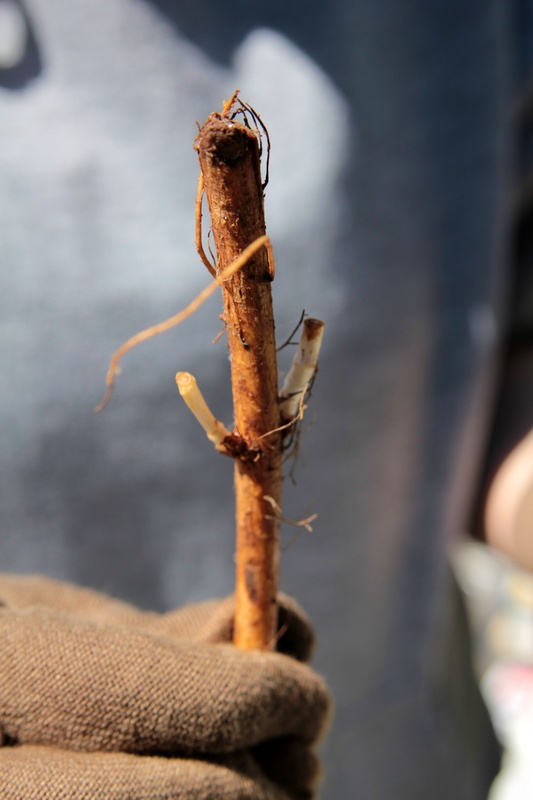 Lots of shoots on the Willamette rhizome. 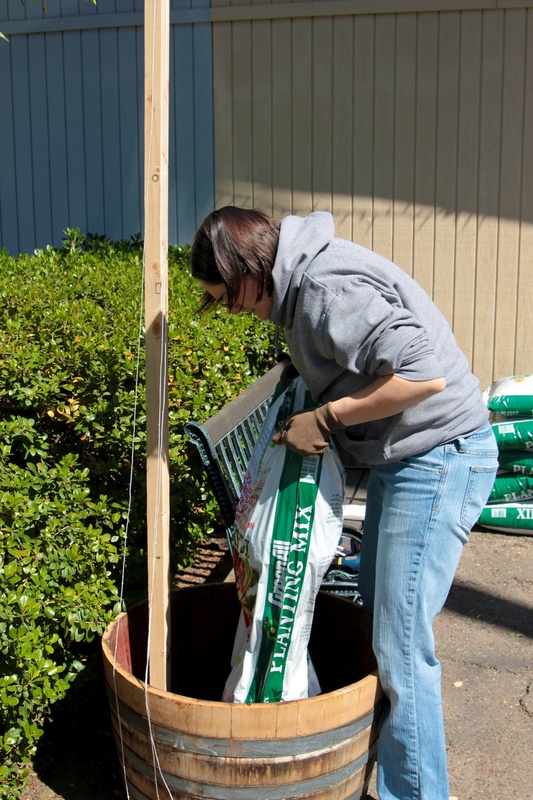 Gardening has been something that we have loved to do ever since Eryn and I moved to our current home. We have a great vegetable garden that we grow during the summer, flowers during the spring and a collection of roses that border our back fence. Since we started brewing we have talked about the possibility of growing hops as well but we were always concerned about space and unsure how we could trellis them. 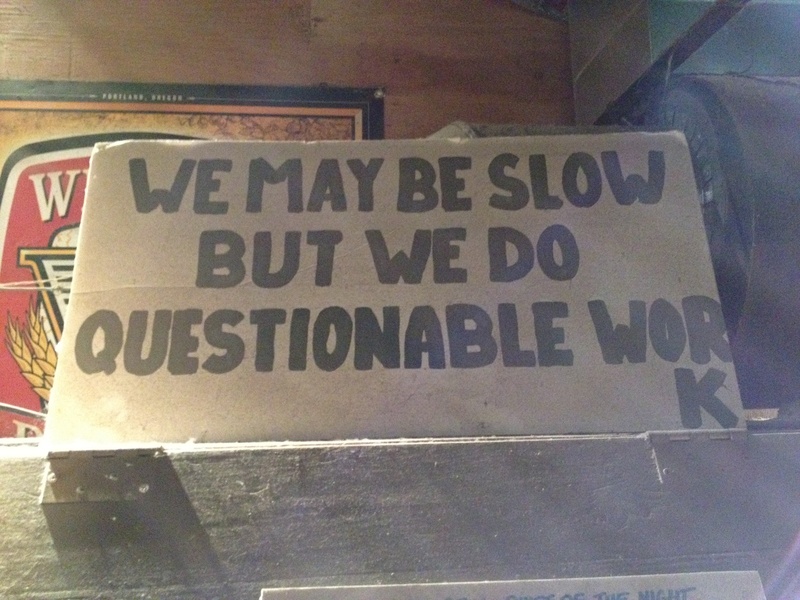 A few weeks ago during a stop at our local homebrew supply we noticed a sign for their hop rhizome sale. On impulse we ordered two rhizomes, one Willamette one Cascade, and just decided we would figure it out when we got them. 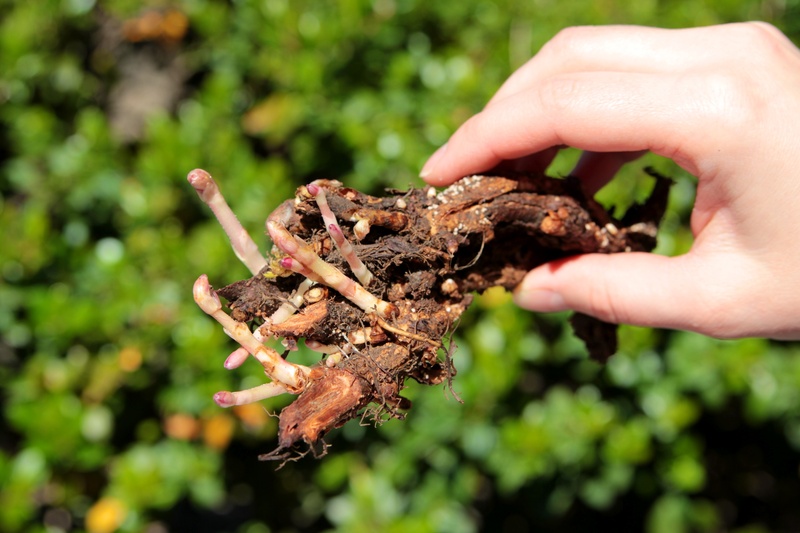 A few days ago we got the call that our rhizomes were in and we realized that our opportunity to procrastinate was over, it was time to figure out how we were going to grow these guys. 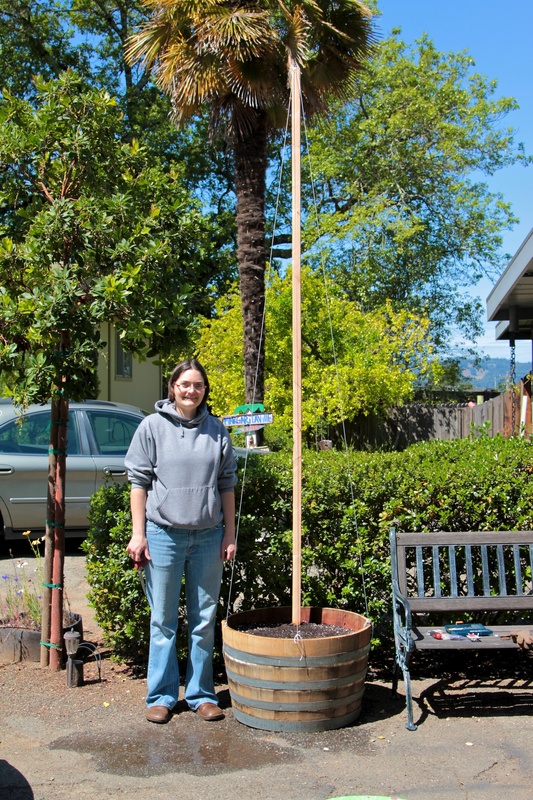 Since we don’t want to plant them in the ground but we wanted enough space for their root structure it we decided to use half wine barrels as our planting vessels (it doesn’t hurt that we live in wine country and they are easy to find). 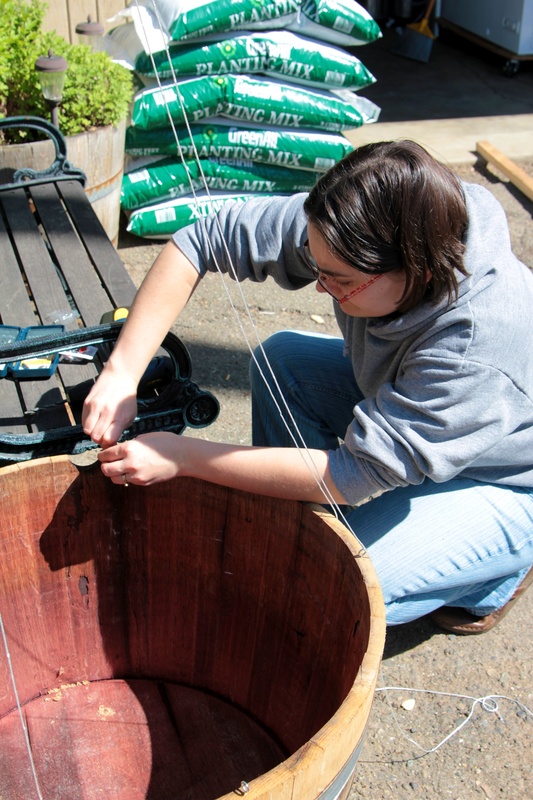 For trellising we headed down to the hardware store and chatted up one of the guys. 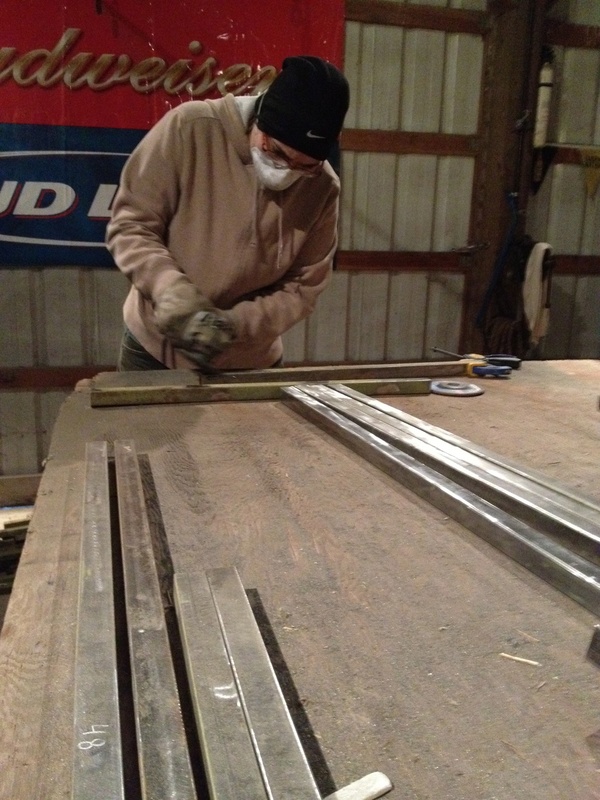 We needed something about 10′ tall and eventually he suggested he rip a 10′ 2×4 in half for us. 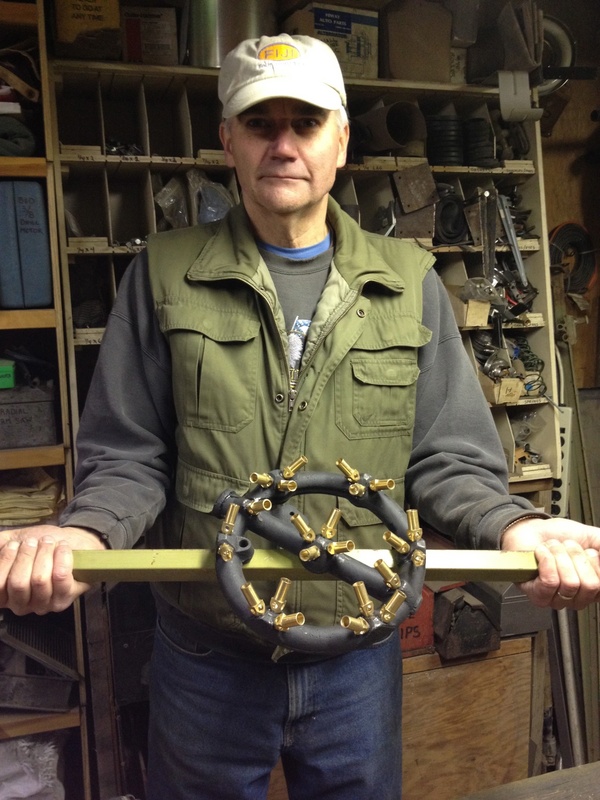 That would work perfect so we had him do it, picked up some galvanized brackets, some eye hooks, and some nylon thread. We then proceeded to check out where the clerk had a hard time understanding that our 2×4 was cut in half long ways and it was actually just one 2×4. 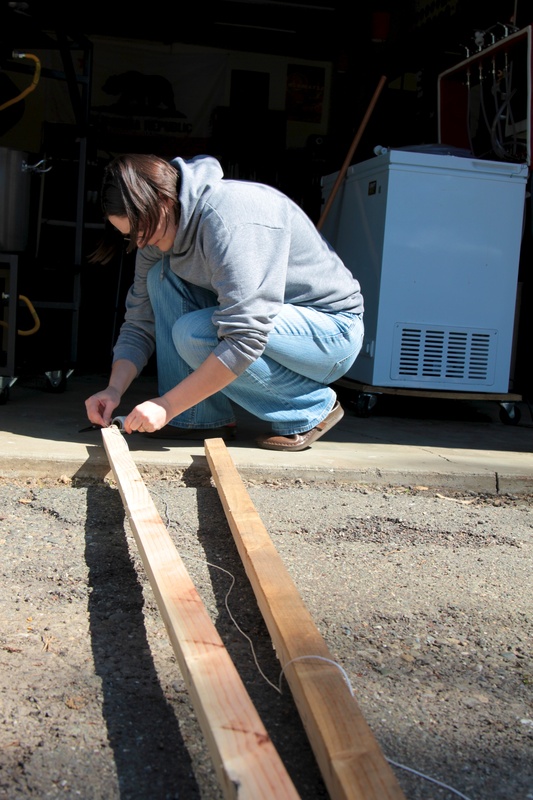 After some radio chatter to the lumber yard she gave up, charged us for a single 2×4 and we were set. 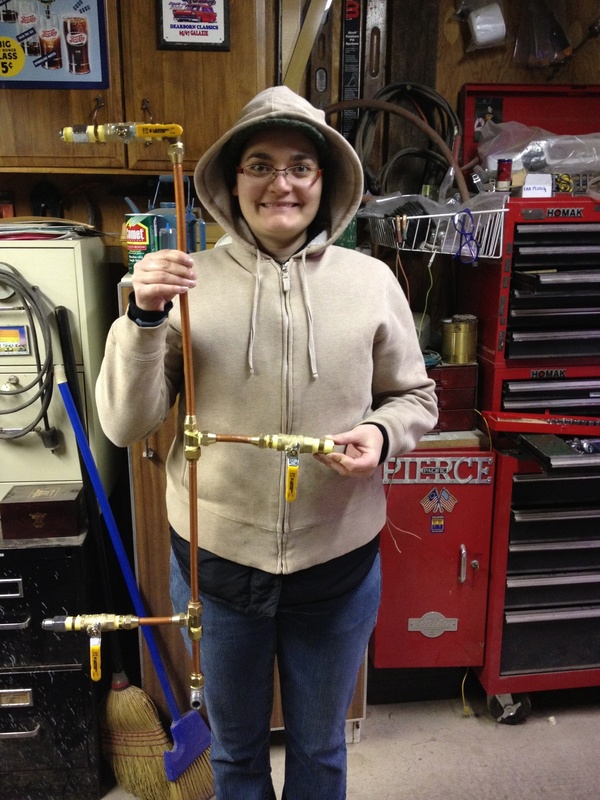 Bracketing the hop support posts. Back home we prepped the long posts with an eye hook at the top, brackets on the bottom and three long strands of thread tied off on the top. 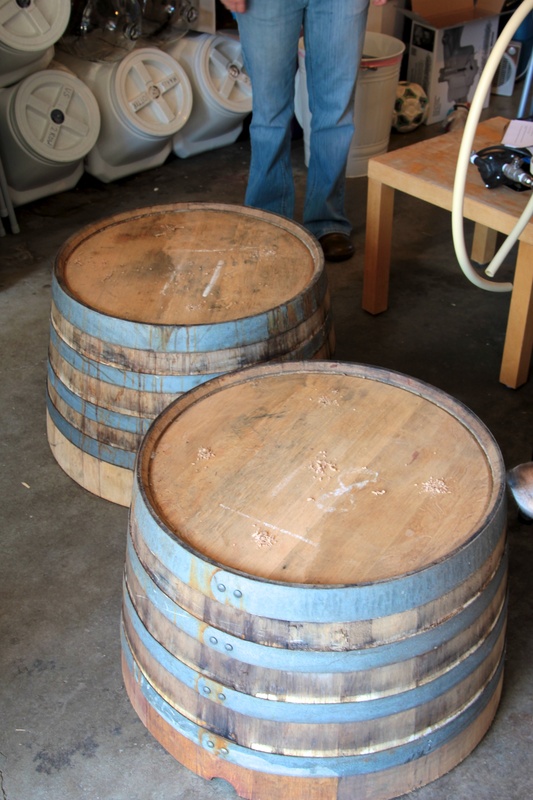 We drilled out our drain holes on the barrels, attached the posts to the bottom of the barrel. 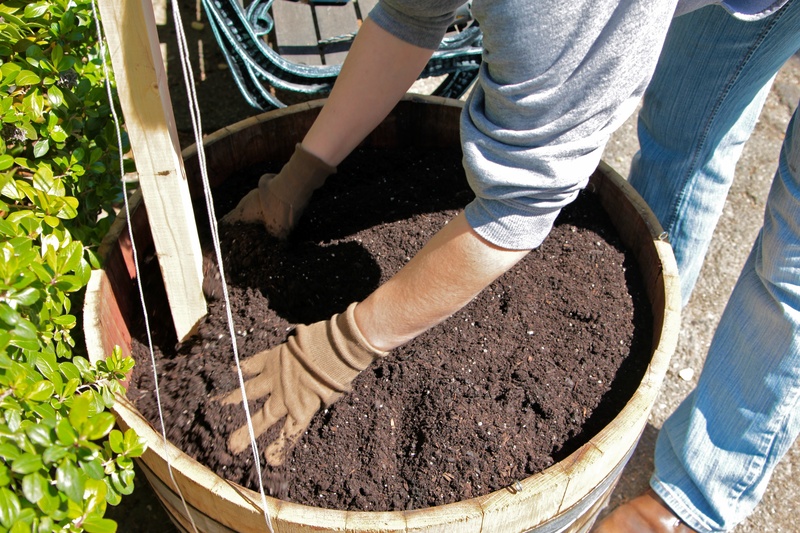 Next into the barrel was the potting soil, rich and moist ready for the hops to take root in. 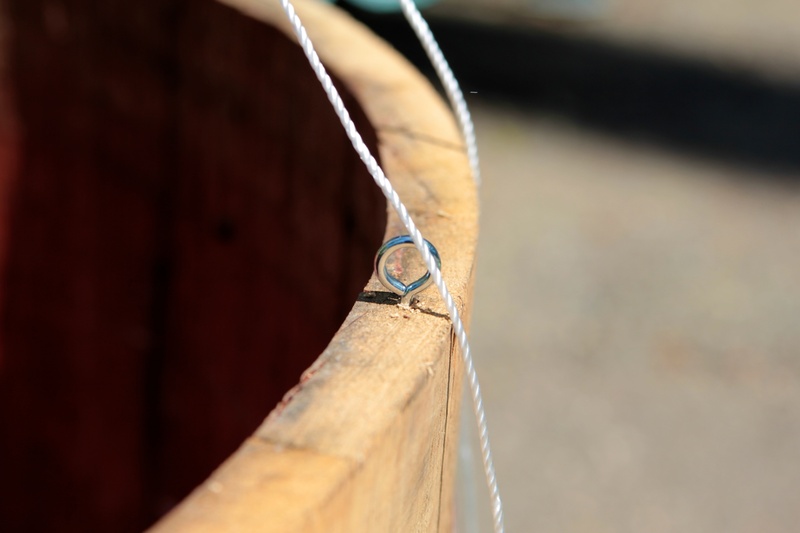 We then screwed in three eye hooks around the edge of the barrels and tied off the thread. 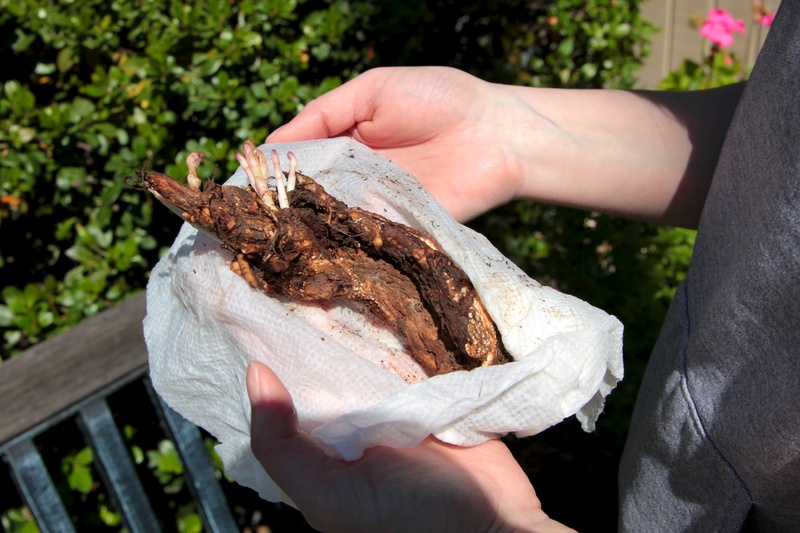 Finally we delicately planted the rhizomes shoots up. We stepped back to admire our two awkward sail looking wine barrel apparatus on the edge of driveway. Until the hops come up they will continue to look weird but once they start climbing those threads it should look great. We can’t wait to see how it goes and we will definitely keep posting as the shoots break the surface and eventually start producing hop cones. 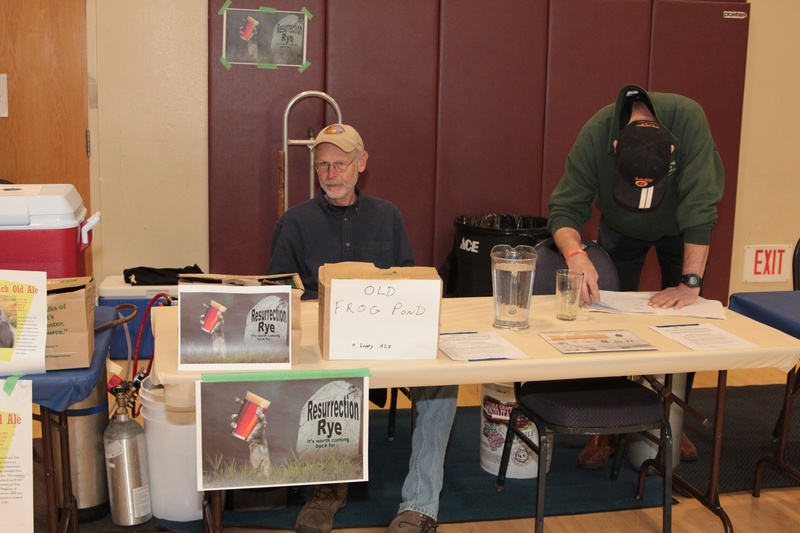 Last weekend Eryn, bill (my dad), and I all made the trek up to Arcata to pour some of our beer at this great event I discovered called the Humboldt Homebrew Festival. 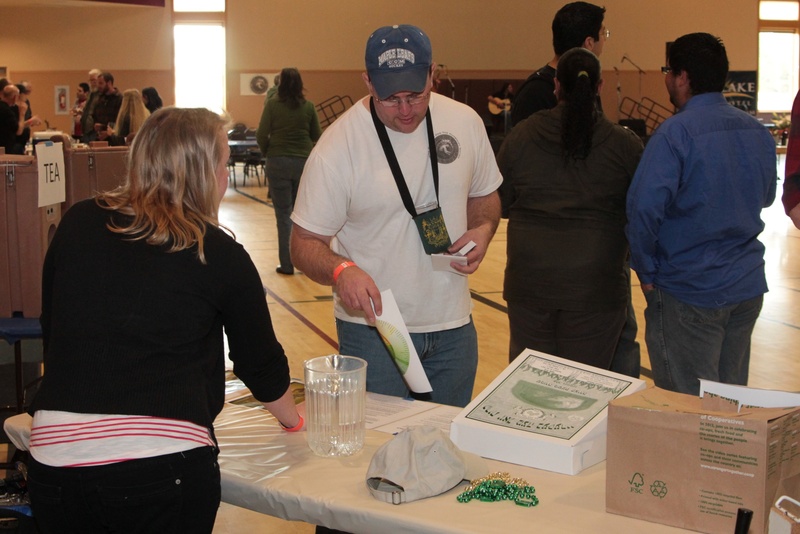 I had come across it the year before but not early enough to get any beers together to pour so this year when I saw it come around on the competition schedule we made a point of getting registered and getting some beer together. And now I am so thankful we did. 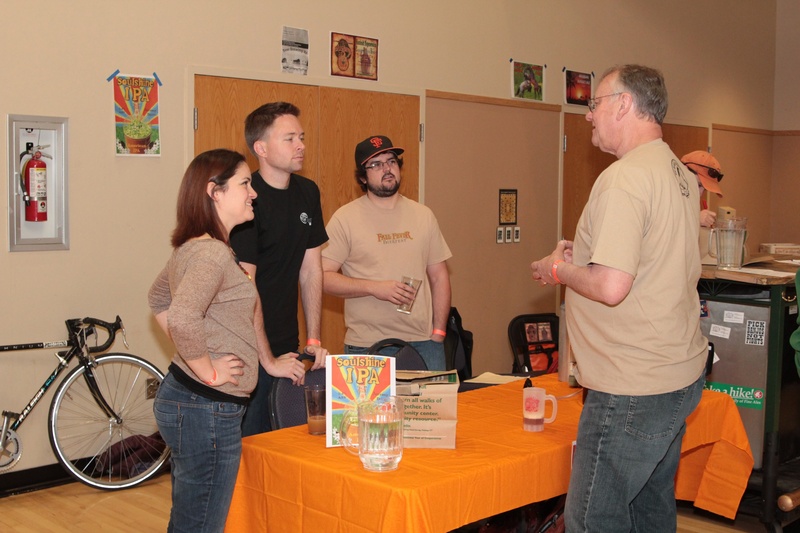 This was the second annual Humboldt Homebrew Festival and from what I heard it’s growing at an amazing rate. 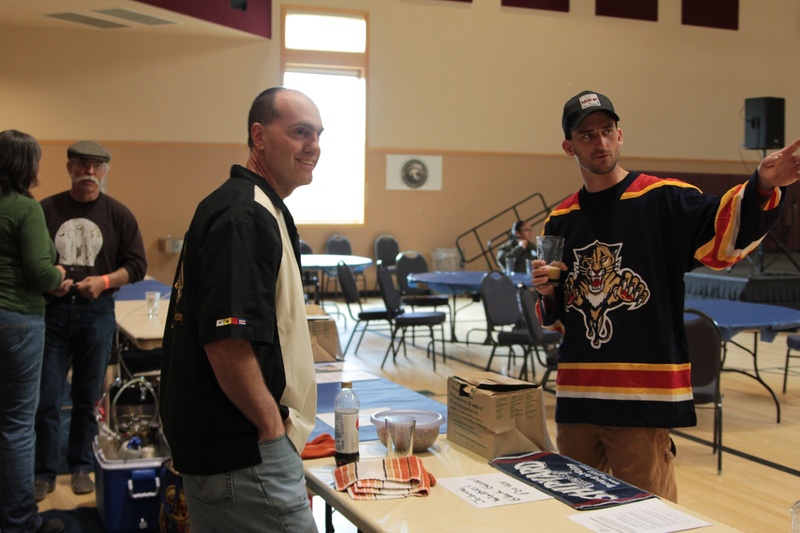 There were two parts to the competition, first a bottle competition that was judged the week prior (by some truly amazing judges from the sounds go it), and the second part a pouring competition that was voted on in a “peoples choice” style. All of the proceeds of the event go to Engineers Without Borders projects in Camoapa, Nicragua. Headed up we weren’t really sure what to expect from the festival. We had exchanged a number of emails with the organizers who were great but this was our first time pouring for complete strangers and only our third bottle competition we had entered. 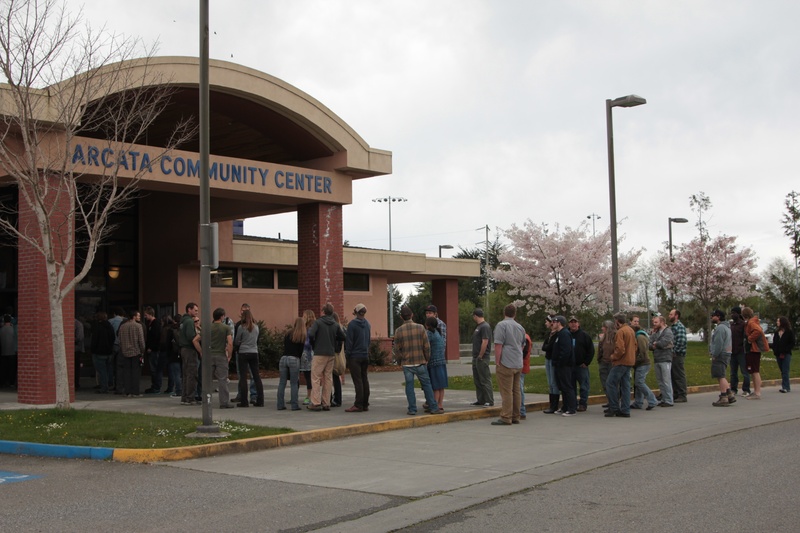 When we arrived at the community center to drop off our kegs the night before the Festival we found a decent line of other brewers already there and by the time we got our kegs into the cooler it was clear there was a ton of beer to be poured. 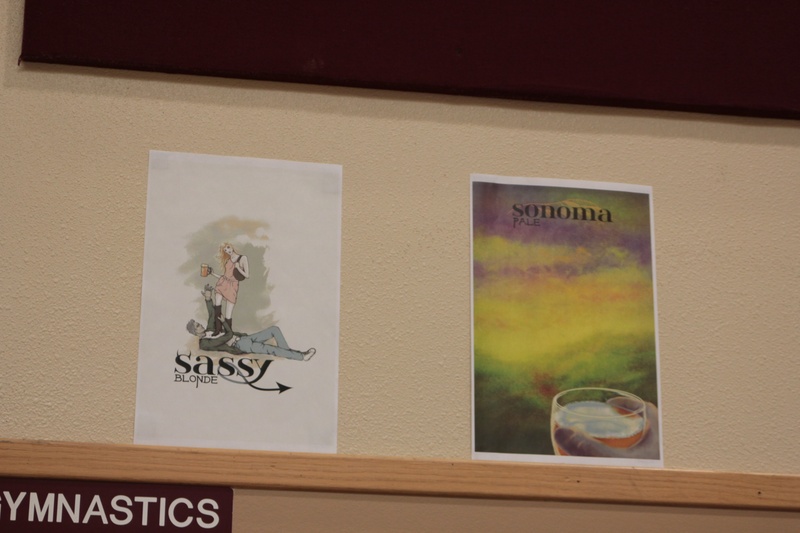 We then picked out our spot, checked out our amazing posters (thanks Gabe! ), and headed out to find some food. A quick aside to the Festival, Arcata is quite the foody town, we found an amazing pizza joint, a crepries, and great sushi. 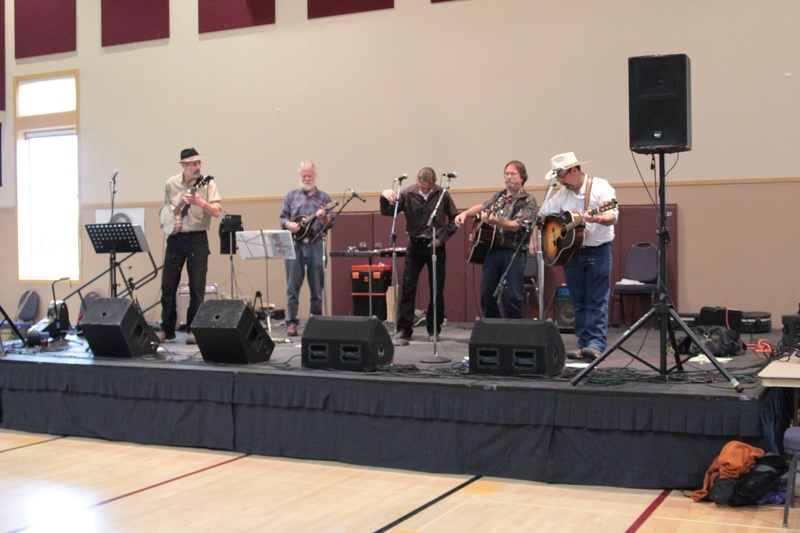 After dinner we headed out to Redwood Curtain for a beer and some music before calling it an evening. 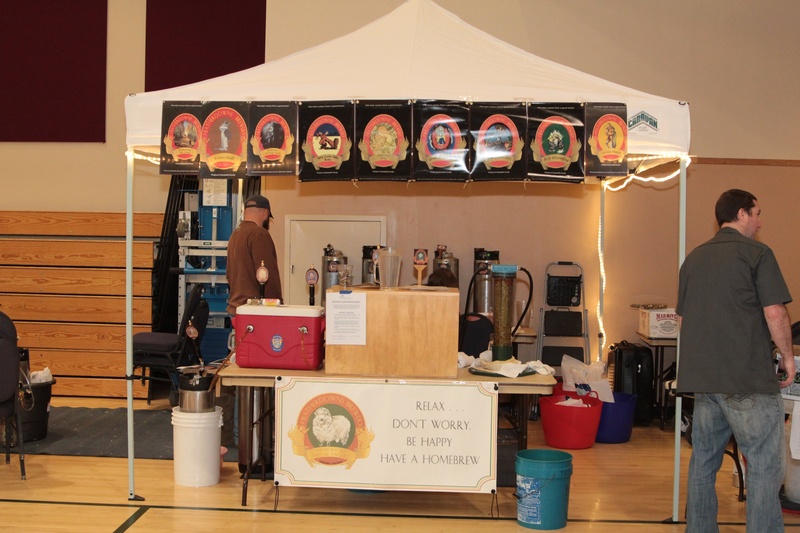 As brewers we were asked to be back at the Festival at about 12:30 to set up before they opened up the doors at 2:00. Seeing how this was our first time using the Jockey Box and setting up a table we arrived a few minutes before 12:30 and eagerly started fitting everything together. With only minor hiccups (Jockey Boxes work better with washers) we were set up and nervously pouring through the first beers on the system. They came out foamy and full of sediment. My nervousness doubled. We tweaked things, no change. 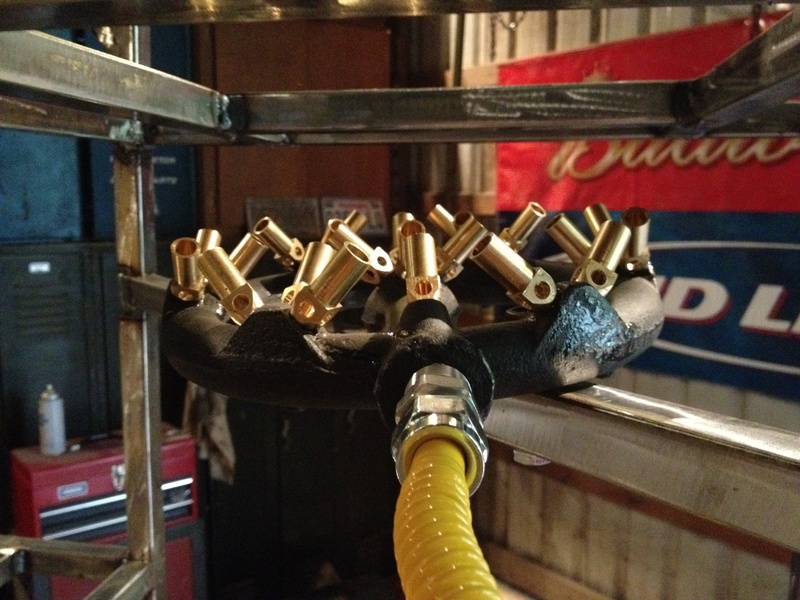 After I few minutes I noticed the beer headed out of the kegs was clear in the hoses, after we poured a few more it was coming out clear and as the coils chilled the foam subsided. Nervousness changed to excitement. We finished prepping our spot with ingredient cards for the beers, our posters, magnets and cards. Then the doors opened. The next few hours flew by. Eryn poured the Sonoma Pale as I poured the Sassy Blonde. 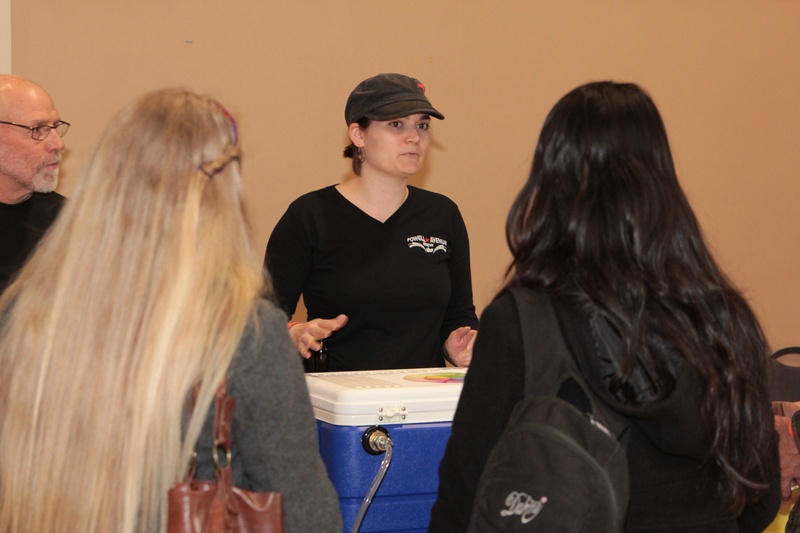 Our posters drew people in and our beers turned heads. My dad would fill in and cover the tap as someone would inevitably pull one of us aside asking questions about how much strawberry we used, or how we got that great hoppyness without the bitters on the Pale. 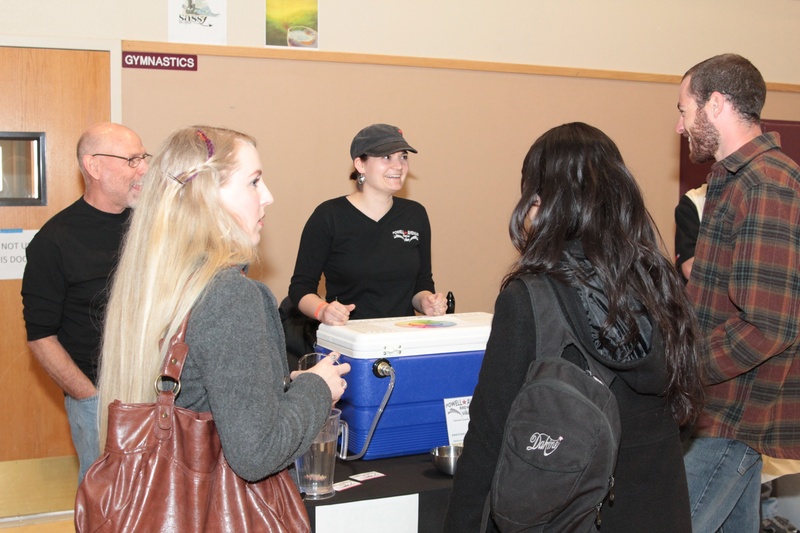 We had people lined up waiting to try our beers. Pour after pour we would watch as that first taste passed their lips and there would be that sudden look back at you with an acknowledging look of “wow, this is really good”. As the afternoon went we had repeats coming back to no longer sample but just get more. 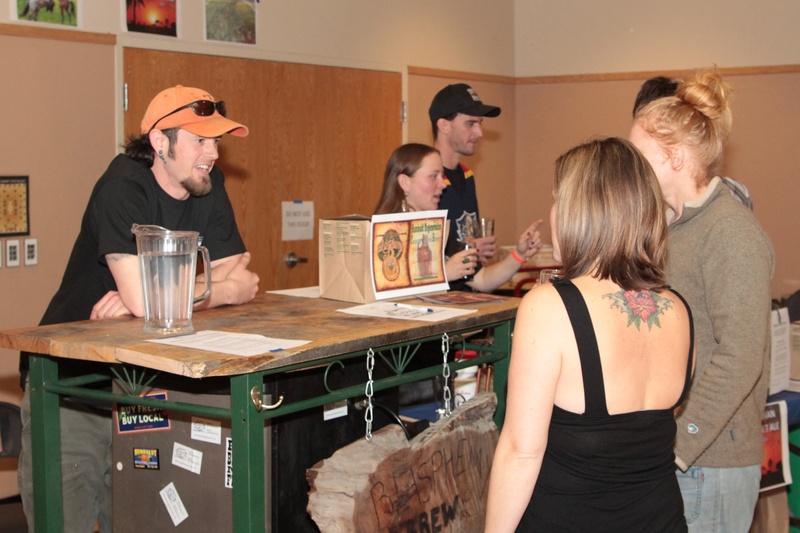 They started bringing their friends, then telling their friends to come check out our beers. 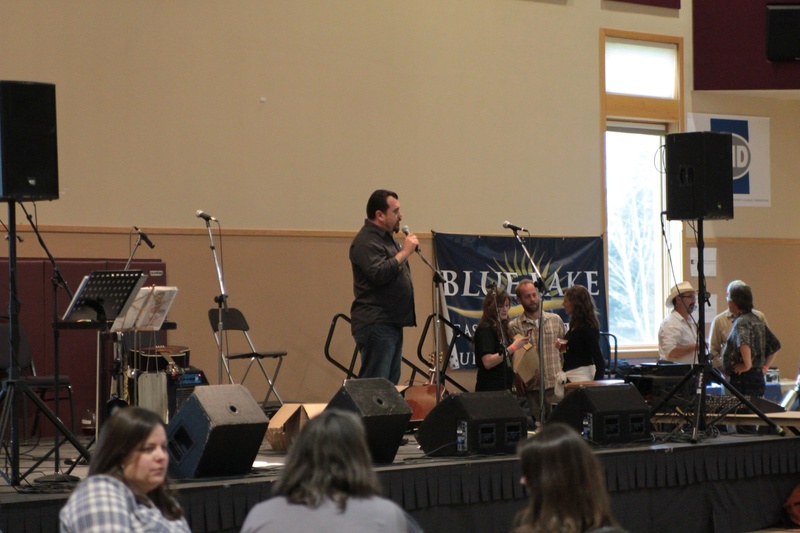 A few hours into the event they started announcing the winners of the bottle competition. 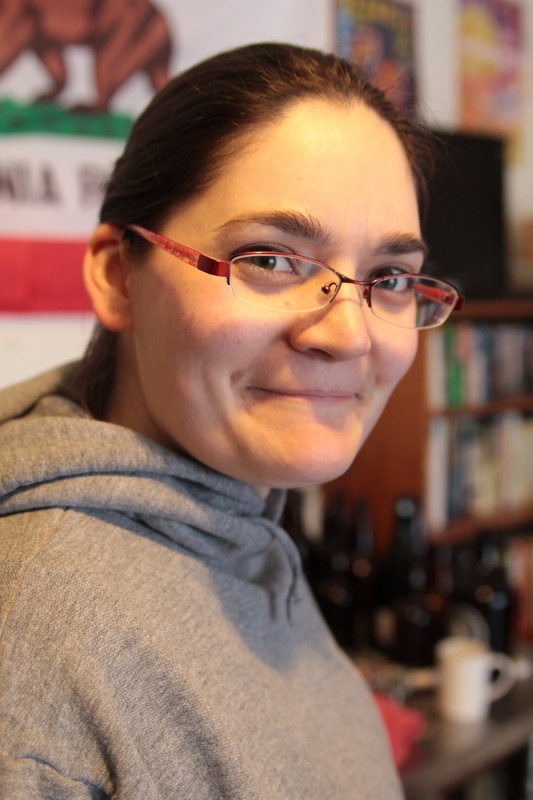 We were elbow deep in pouring beers when we heard Eryn’s name called the first time, then a second, third and fourth. She proceeded to go up to the stage to accept her ribbons for the Hi-Lo (3rd), Eryn’s Punkin Pie (3rd), Sonoma Pale (3rd) and the Ryelistic (2nd). Each time the applause got a little louder as the attendees recognized she was up there again. 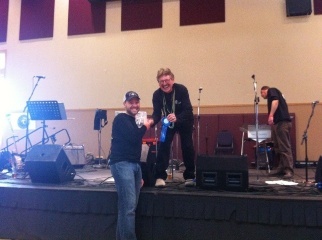 Then my name got called for a first place ribbon for our Sweet Stout. 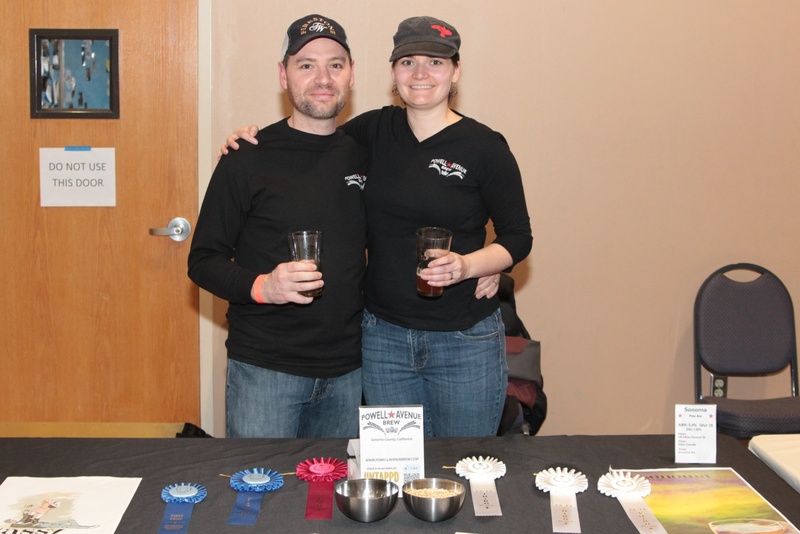 Shortly after that as I was pouring more Sassy when the announcer began talking about the best of show beer “A sweet stout named Ebony,” Eryn and I’s chins nearly hit the floor as my name was called for Best of Show. The reason we compete is to get honest, unbiased reviews of our beers. 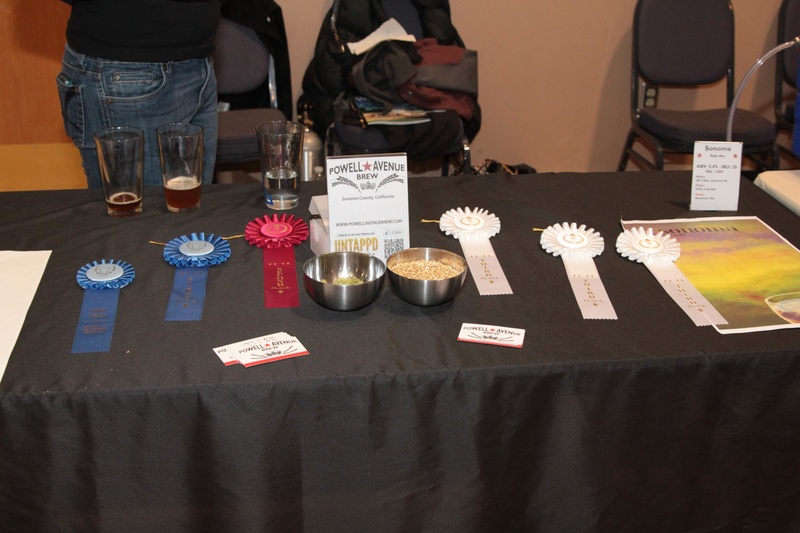 Competition is the best way to learn about how you are doing making beer, we never believed we would get so many ribbons let alone Best of Show. It was humbling. Then the first keg kicked. About half an hour later the second one followed. We were out of beer. 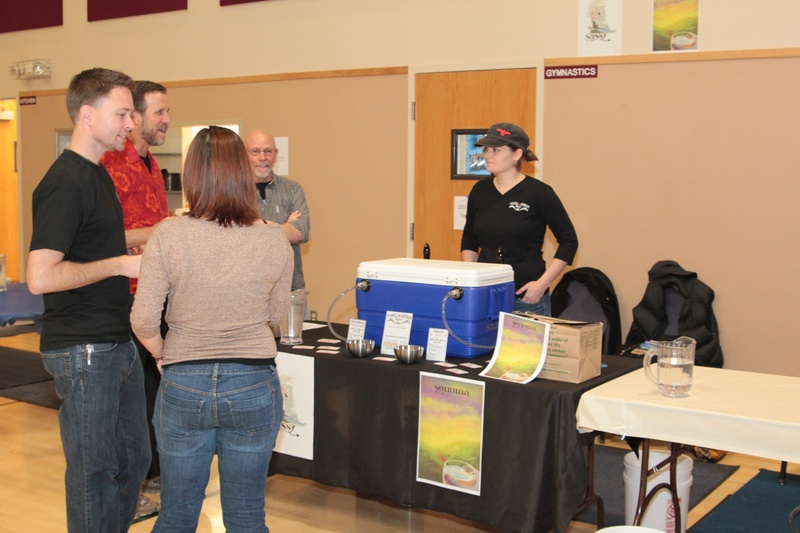 Folks were still coming up wanting to try our beers, especially Ebony, which we had not brought, but we had nothing left to offer them. We cleared the jockey box off the table and set out our ribbons and vacated to check out the rest of the festival. 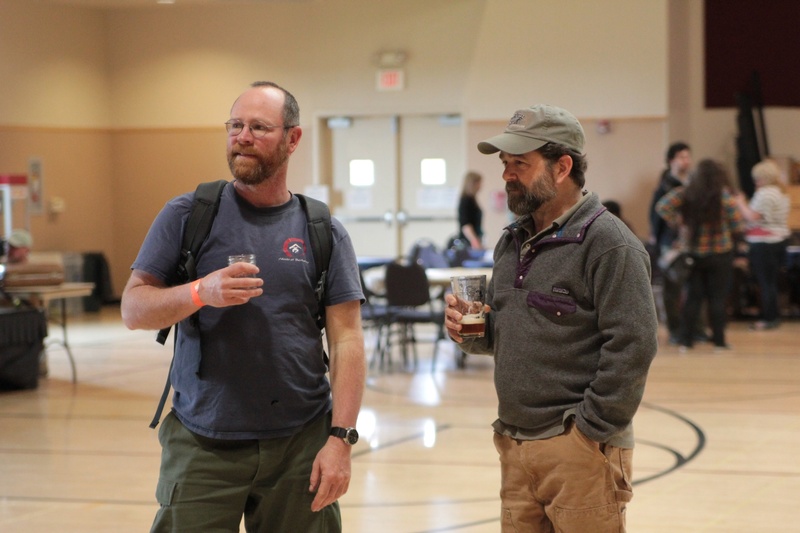 A lot of other brewers had started kicking their kegs as well so we mingled, chatted and just hung out. Everyone at the fest was having a great time but no one was overly drunk. It was a great crowd that was there to appreciate the craft all us amateurs brought with us. 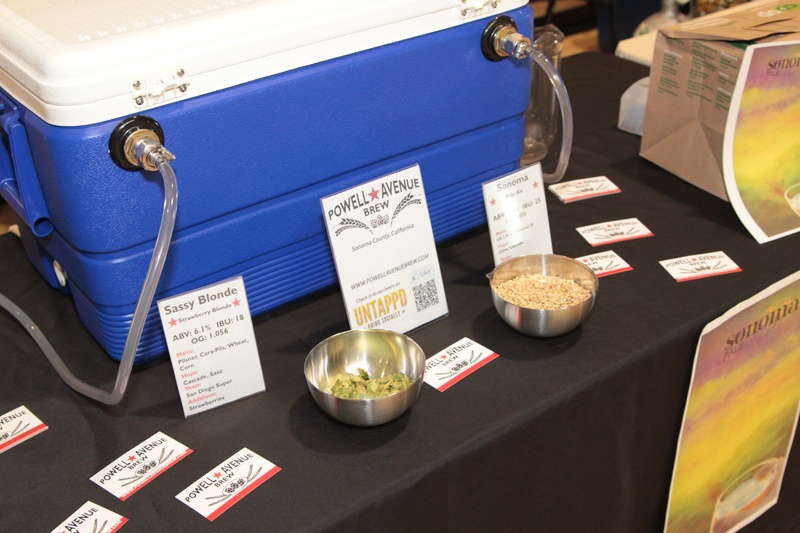 As the evening wound down the awards for People’s Choice were announced, three IPA’s took the top spots. After that we packed up the rest of our stuff and said our goodbyes to our new friends. Now, even a week later, I can still feel the rush of sharing our creations with people. There is something about watching people come up for a taste then turn to you excited about what they are trying. 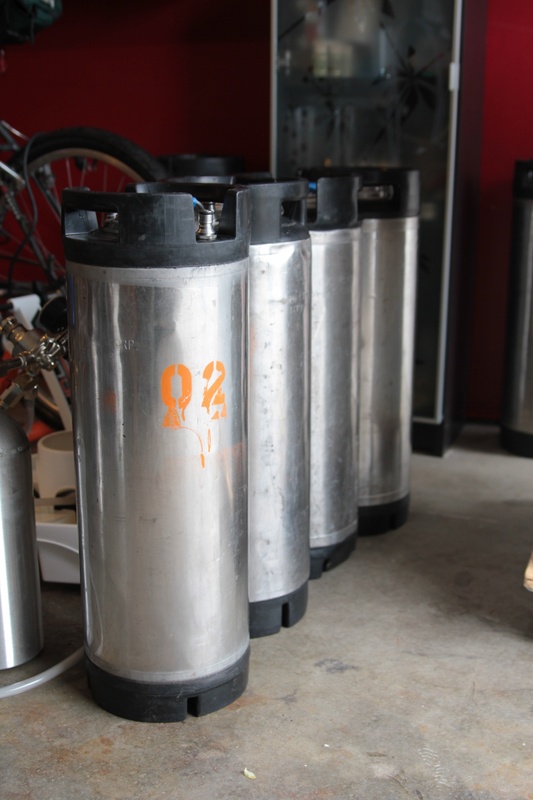 I was really disappointed when we kicked our kegs and had nothing left for people. I wanted to keep sharing our beer with them and watching those reactions. 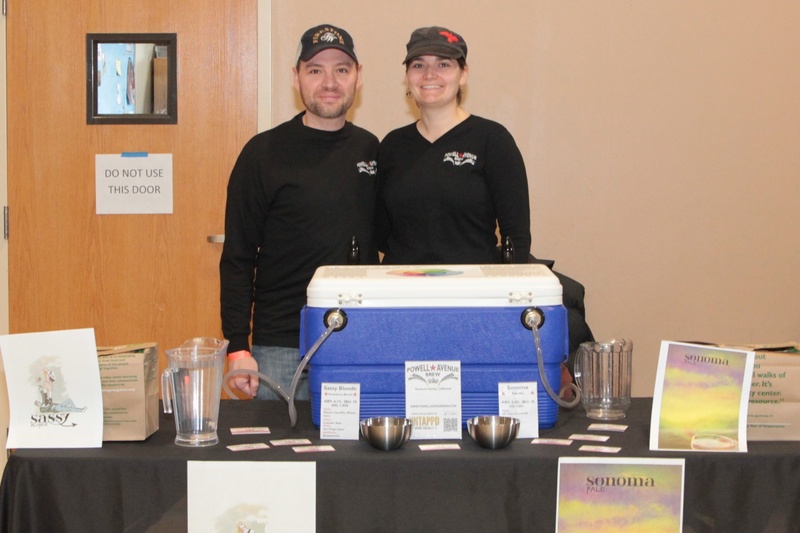 I cannot wait until the next time we get to pour at an event. 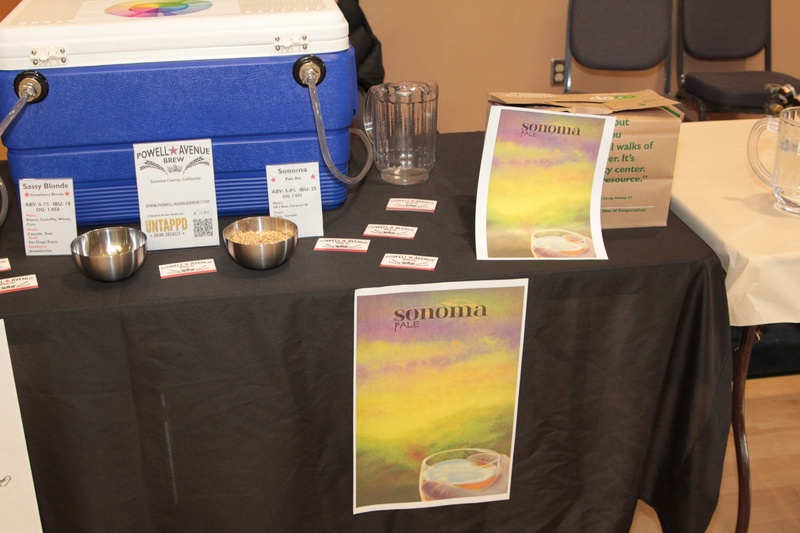 And for those of you that did not go to Humboldt for the festival, either as brewers or just tasters, go next year. It’s a great event, a great cause, and a remarkable time. 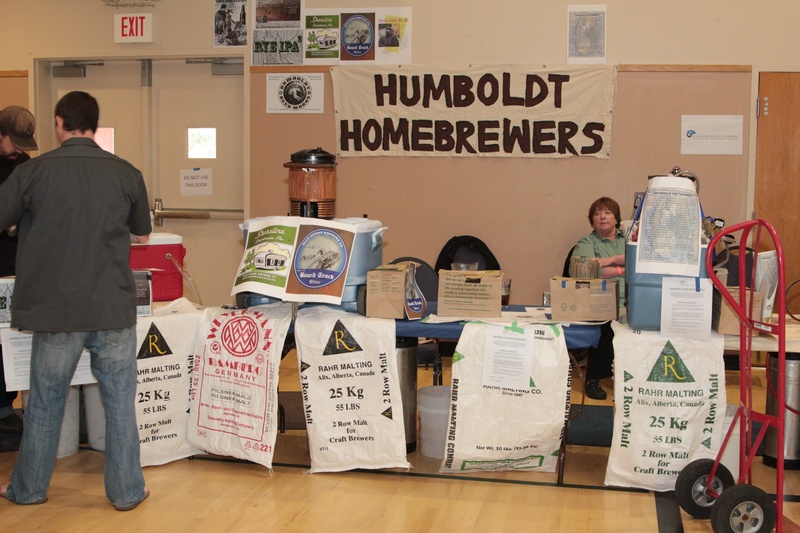 Thank you to all of you who put it together, we will see you again next April for the 3rd Annual Humboldt Homebrew Festival! One of the gifts that I received for Christmas this year was the book Start Something That Matters. 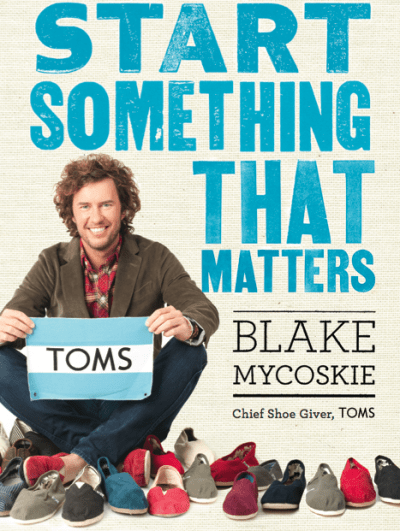 The book is an autobiography of Blake Mycoskie, the entrepreneur that started Toms shoes. It is essentially his story about starting Toms shoes, the inspiration, the community need and the new way he has decided to do business. If you don’t know about Toms it’s a shoe company that’s building its reputation through its One to One program. Every time you buy a pair of Toms shoes they give away a pair to a child in need. The book is an uplifting story but more importantly Blake guides you through examples he’s experienced and from some select other businesses. All of the examples discuss doing good, harnessing your passion and commitment to community yet still turning a profit. Blake is pushing the bounds on a new style of capitalism where the bottom line is about what you can do for those around you not just yourself. 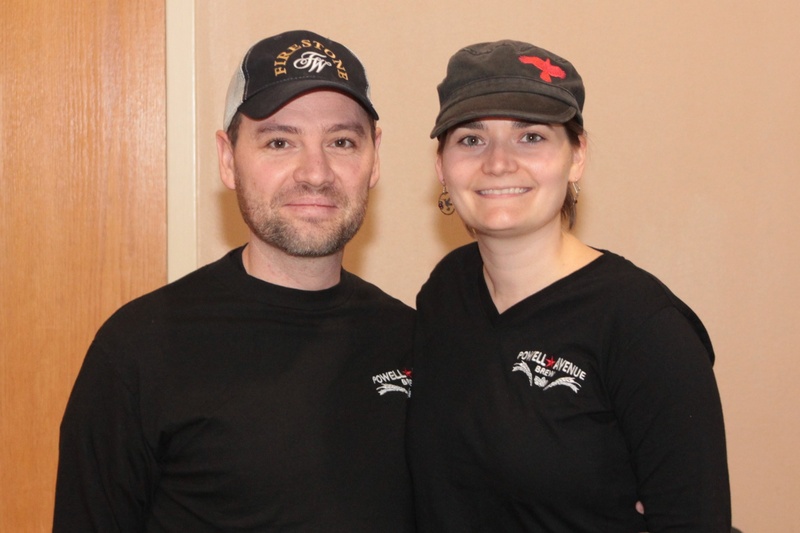 It’s through his passion, commitment to community and amazing story that he has created one of the fastest growing shoe companies and gave back to the place that launched his business. For me it’s an amazing example of how to rethink what is important. When we started brewing beer we decided that sharing it and creating a community was just as important to us as the beer. 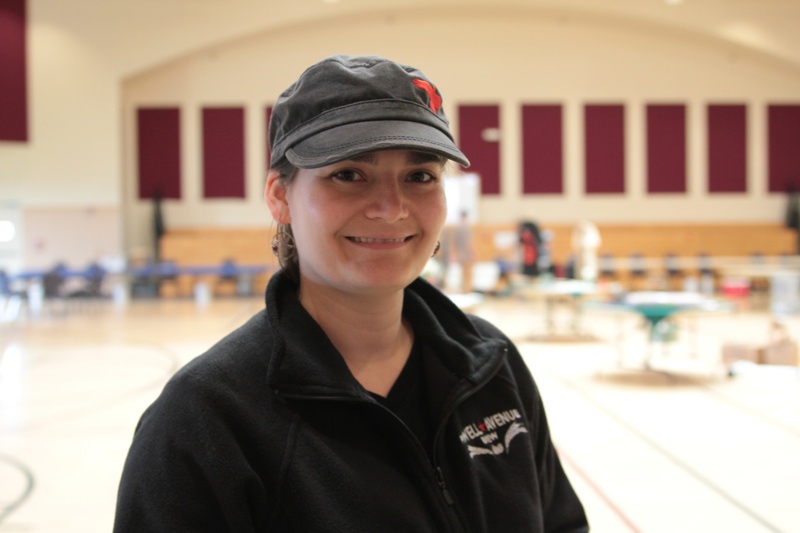 Yet it wasn’t until our last tap party that we started to think about how this new community that we are fostering could also be used to promote good. 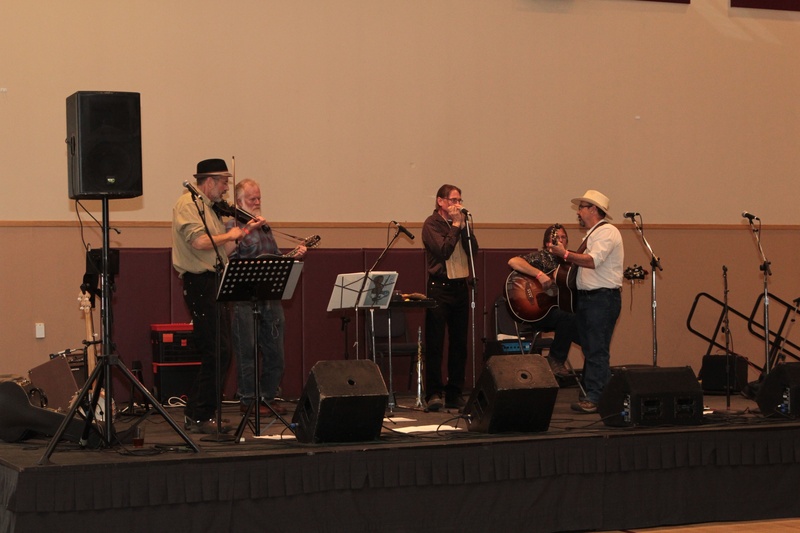 At the last party we invited everyone to contribute to a fund for our local food pantry and raised $200 in one evening. As I read the book I kept kicking new ideas to Eryn about how our hypothetical business would follow Blake’s advice and we even developed our own One to One concept. If you are thinking about starting a business, like a brewery, take the time to read this book. It will make you even more passionate to take that next step but also to think about how through your new business you might be able to affect positive change. And if you are as lucky as Blake that positive change will bring customers flocking. I can’t wait for the day that Eryn and I will get to institute our One to One idea. 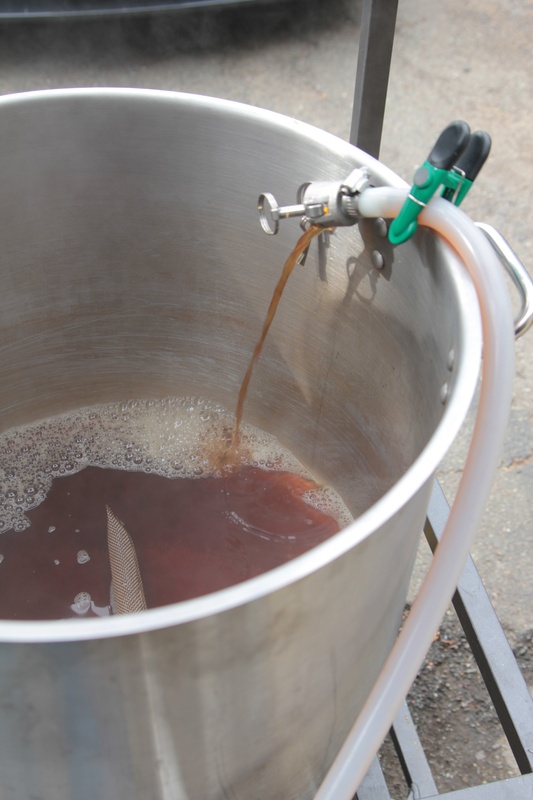 When we started brewing it was single gallon batches and a Mr. Beer kit. We instantly fell in love with it but were quickly outgrowing our capacity. To remedy that we purchased a turkey fryer as a kettle and a cooler to mash in. 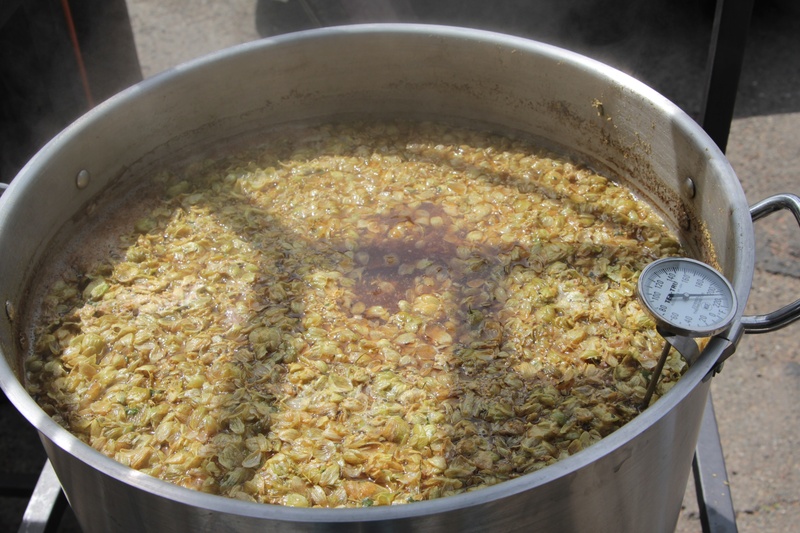 We jumped up to 5 gallon all grain batches and had a great time, but we still felt like there was a piece missing. 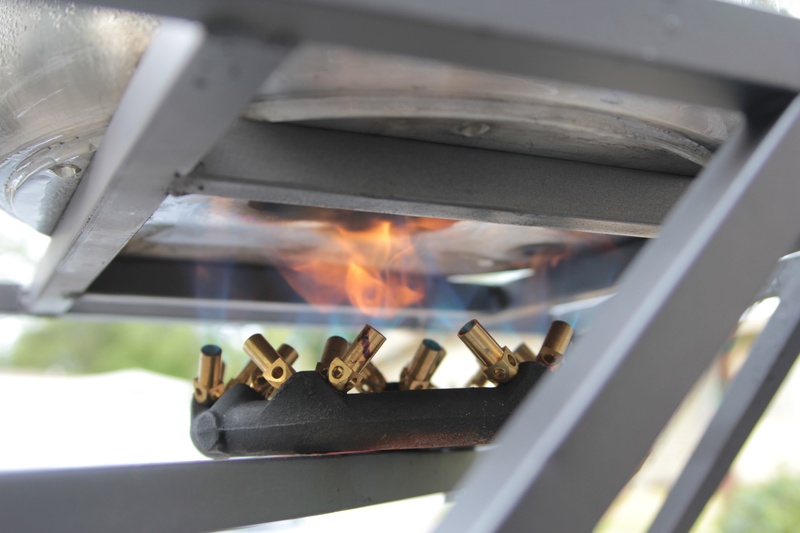 So a few months later we picked up a second turkey fryer to make the system even better. Now we finally had an HLT, mashtun and kettle. 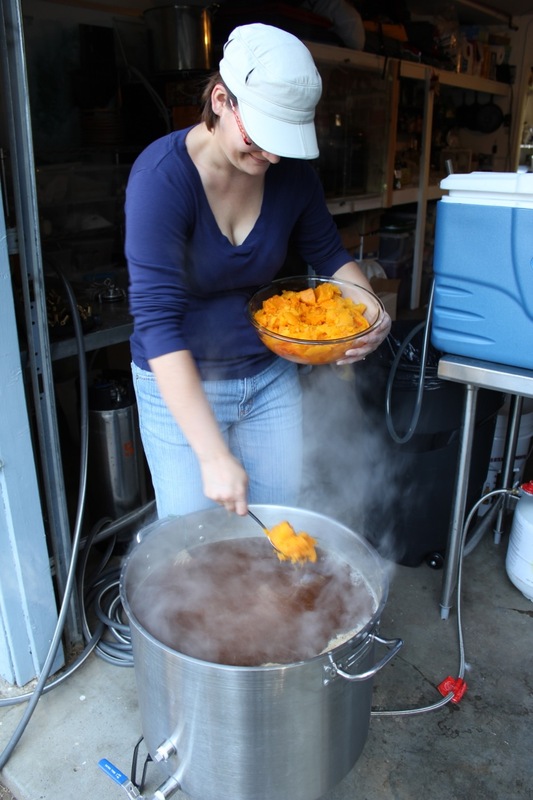 We could actually pull off doing a double day of 5 gallon batches. We were pumped about it but it was scattered setup and still a lot of work to get through a day. 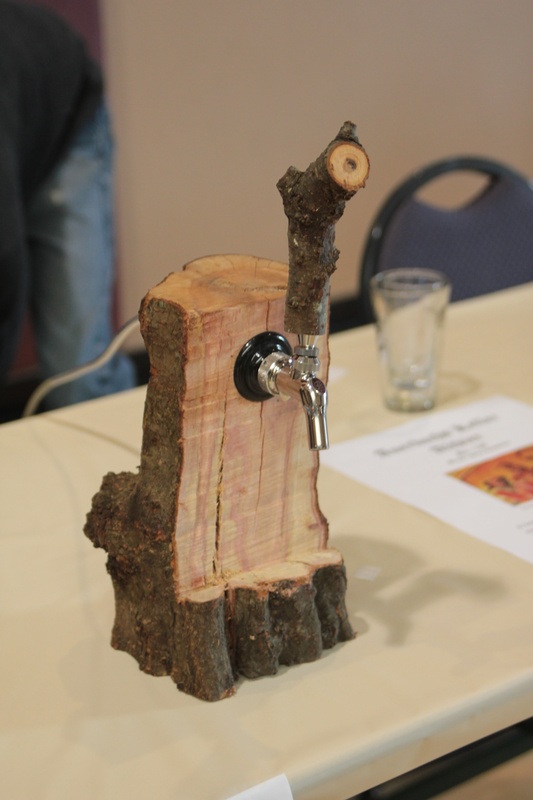 So less than two years after starting to brew we began looking into buying a brew sculpture. After researching different models and looking up prices we decided it just wasn’t feasible this year and put it in the back of our minds for a future date. We could brew most of what we wanted and it’s always good to have aspirations. Then the stars aligned and everything changed. 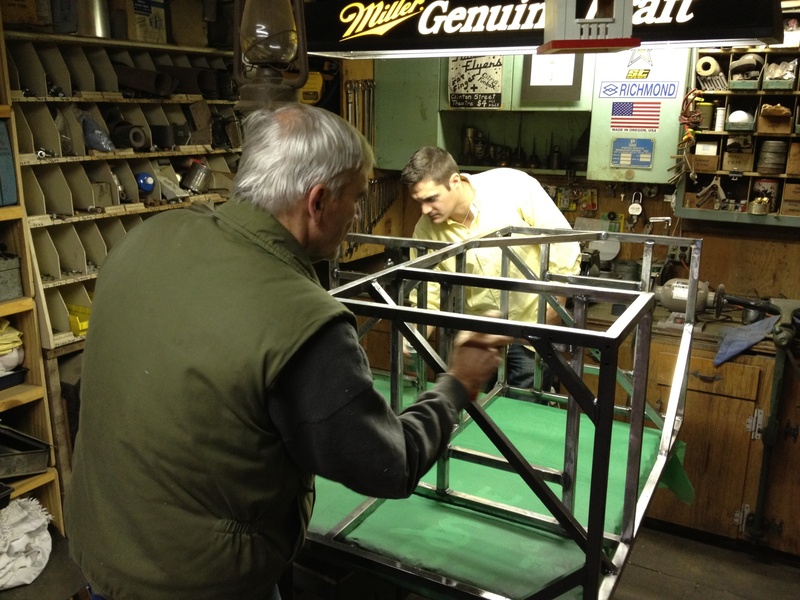 While having a conversation about brewing with Eryn’s dad Steve he suggested he might be able to help us fabricate a brew sculpture. 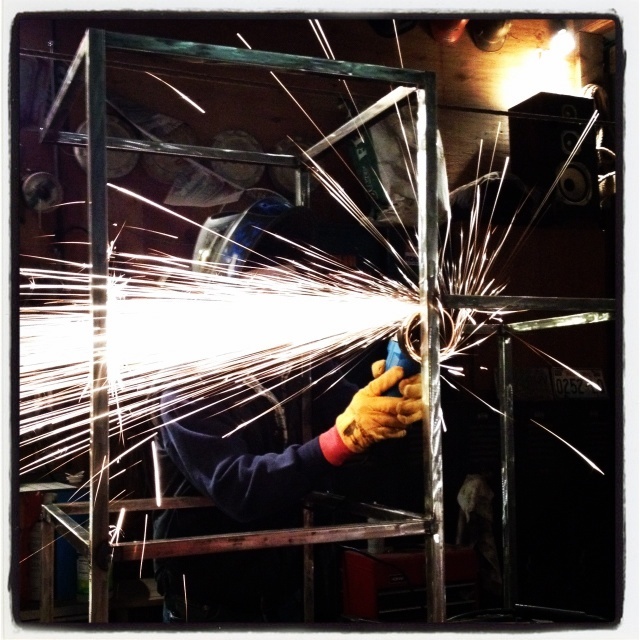 He has done custom metal fab in the past and had a whole shop that we could do the build in. 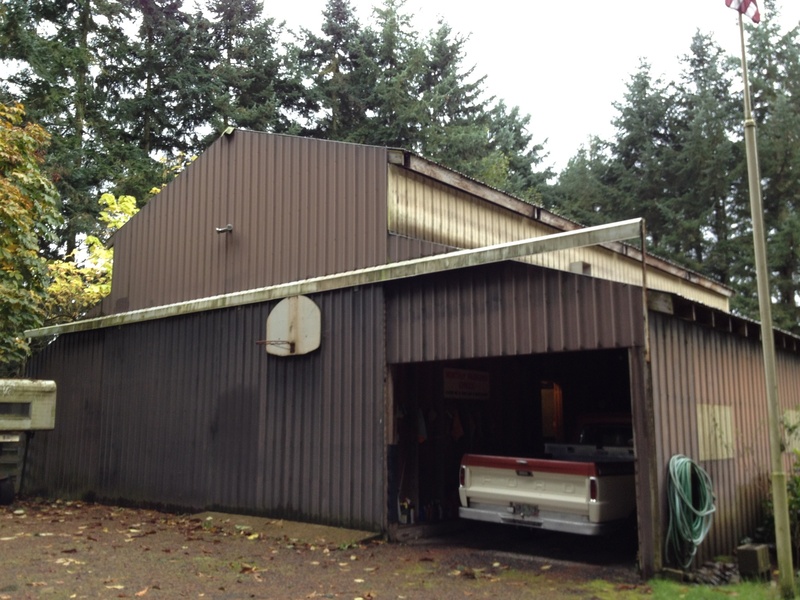 The icing on the cake was that he had just dismantled an old HiLo trailer and had lots of steel tubing we could use to fab with. Suddenly the dream that we had shelved only a few weeks back was quickly becoming a reality. We reevaluated the models we were looking at and came up with a system that we thought that we could build. About a month later took a trip up to the Portland, OR area for a weekend of building. 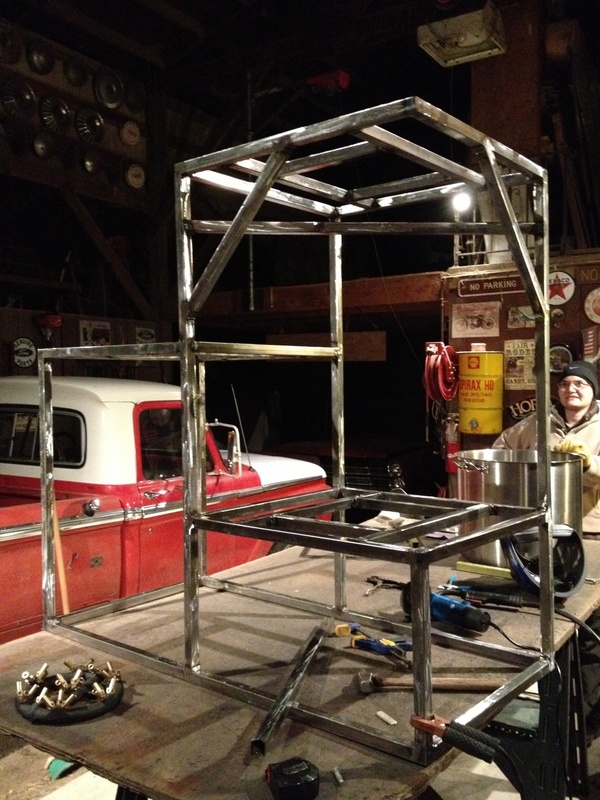 Steve’s barn served as our base of operations for a few days as metal tubbing was measured, cut, ground and welded together until finally it started to resemble a brew-sculpture. 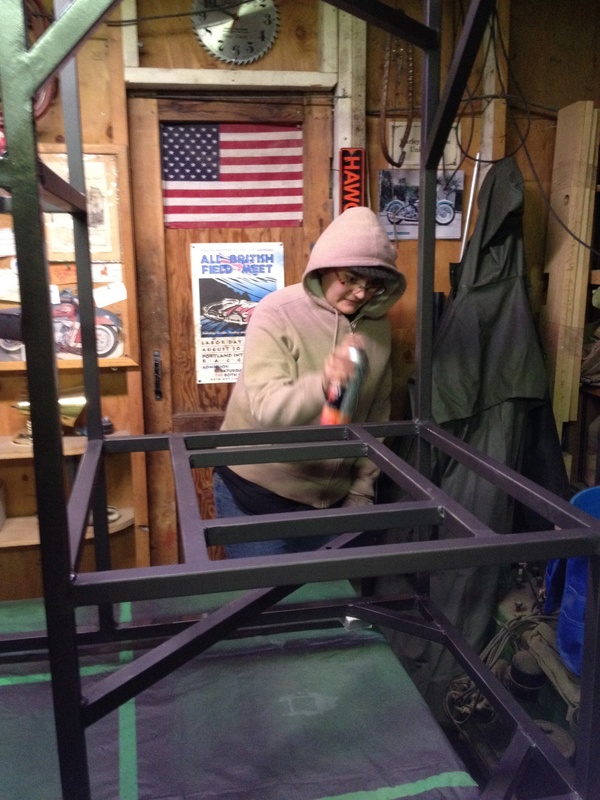 Eryn’s brother Jake also joined us doing most of the welding and did a beautiful job. 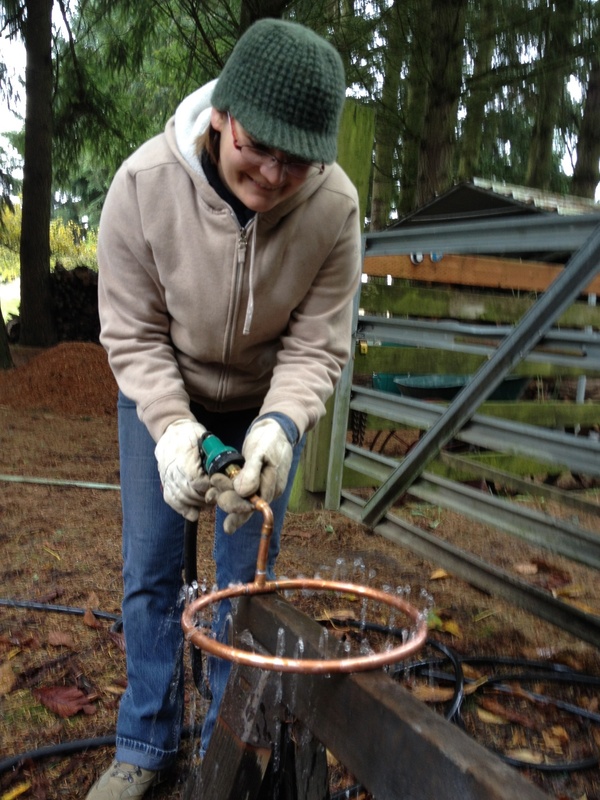 It took us two full days to complete the fabrication, welding, fitting copper piping, and painting the sculpture before we packaged it up and put it a U-Haul that was California bound (another serendipitous happening). 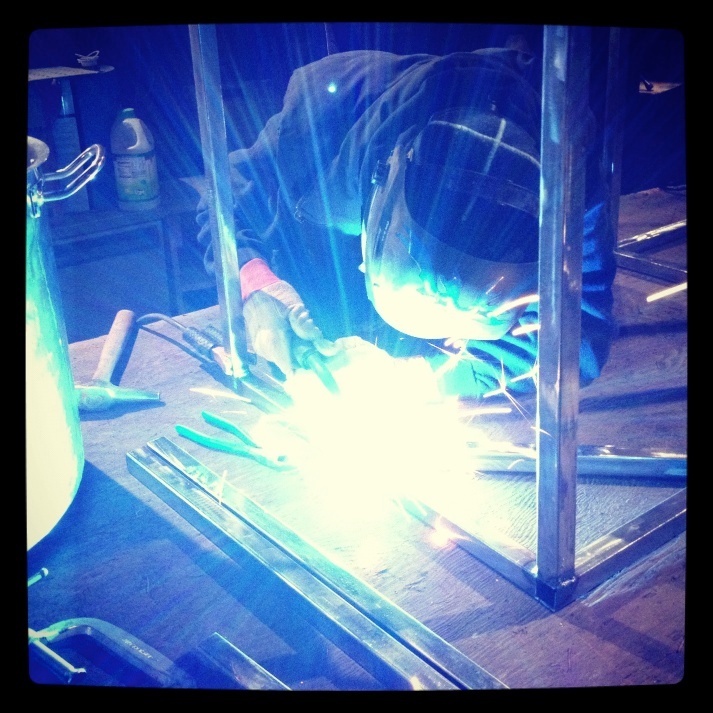 Overall it cost us about $200 for the burners, casters and copper fittings and a weekends worth of time. Once we got the system back down here we made a large MoreBeer! purchase to finish equipping the system. Now we’ve got an amazing system with three 15 gallon kettles, quick release fittings on everything, a pump and a plate chiller. 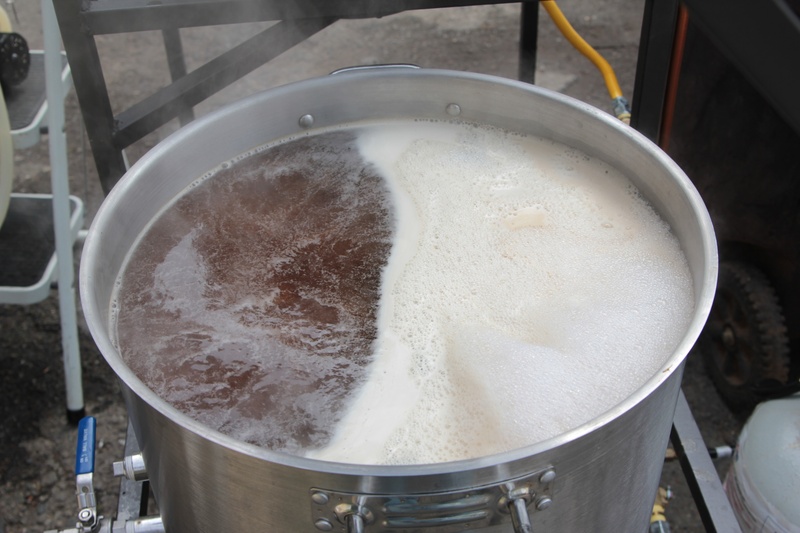 Our inaugural brew was a Belgian Strong Ale that we are calling HiLo in honor of the brew sculptures previous life (look for more on that soon). 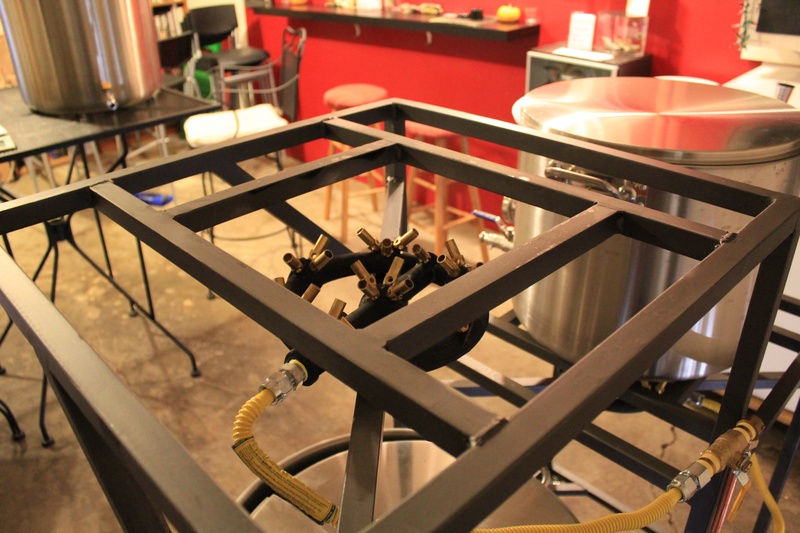 It’s exciting and fun to have built the system that we are now brewing on. We are already pushing way past our old limits with stepped mashes and double brew sessions that are over in six hours. If you are reading this and thinking about building your own system I would highly recommend it. It was a blast to work with Eryn’s family to put this together and now we have a strong sense of pride in our system that we built by hand. We’ll keep you updated as we continue to work with and tweak the system but if you have any questions about it or the way we put it together please feel to ask away, we love to share. 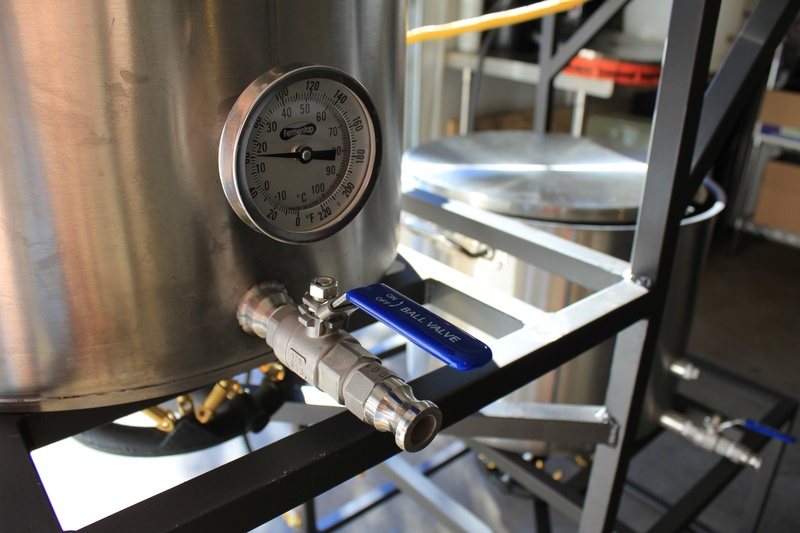 To see the new system in action check out our 60 Shilling Brew Session. It’s been two years now since the brewing bug bit us and it hasn’t let go. This year we doubled down and got even more serious about our brewing, coming up with new recipes, new hardware, and some great parties. We’ve made lots of new friends, rekindled old friendships, and celebrated with our friends and family. 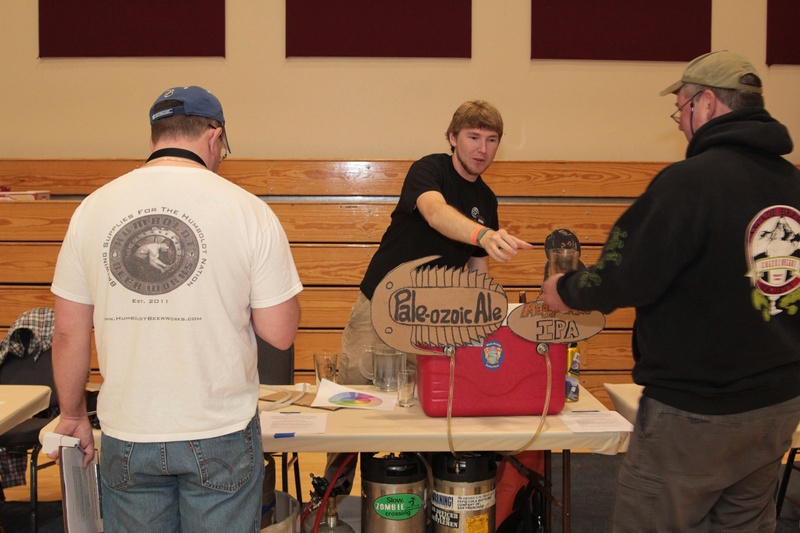 We had six tap parties and lots of folks come to taste through our creations. We love everything about it and can’t wait to see what this new year holds but before we get going here’s the breakdown on the last year. Did you have a favorite beer from the last year? Any suggestions for this next year? It was an awesome year for our brewing but it’s time to say goodbye to 2011 and celebrate the beginning of another amazing year. We look forward to sharing a pint with you soon!